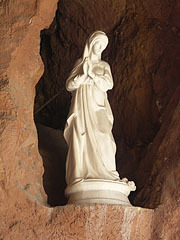 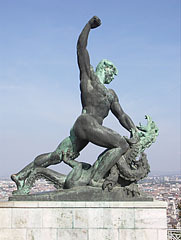 Sculpted by Gyula Jankovits in 1904. 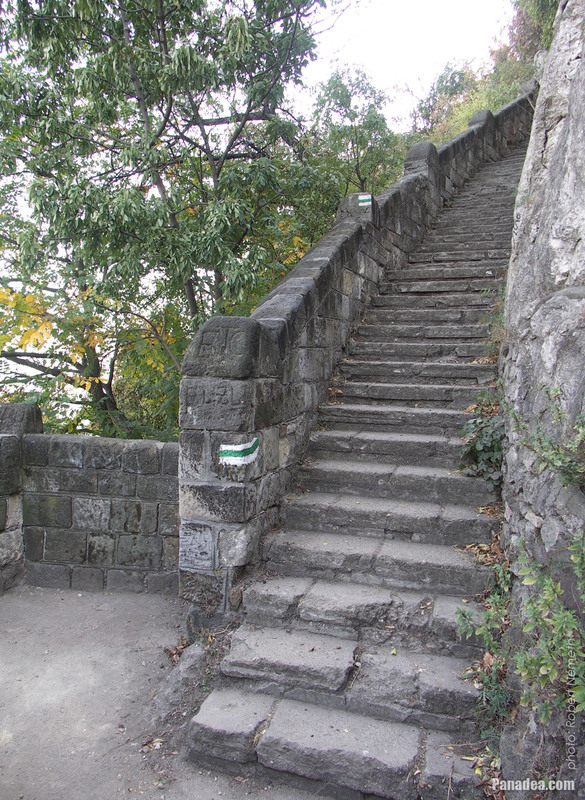 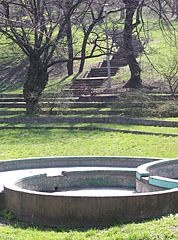 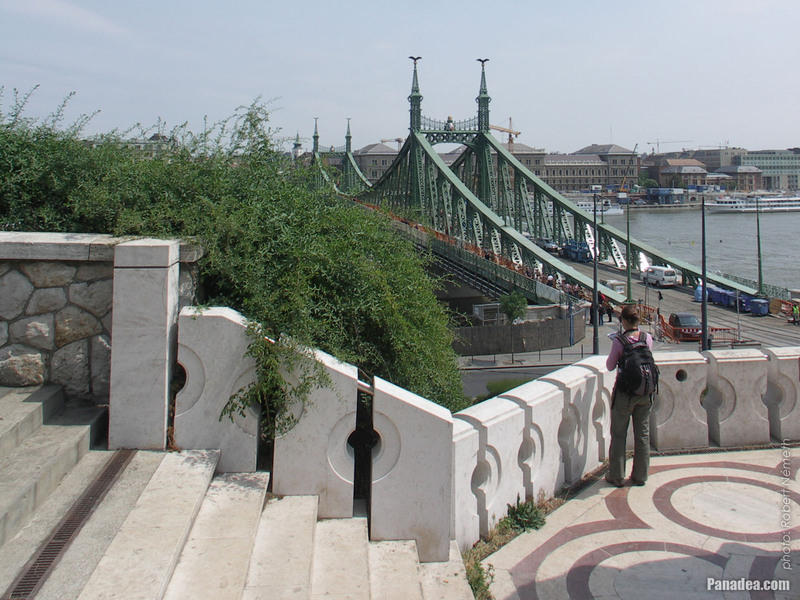 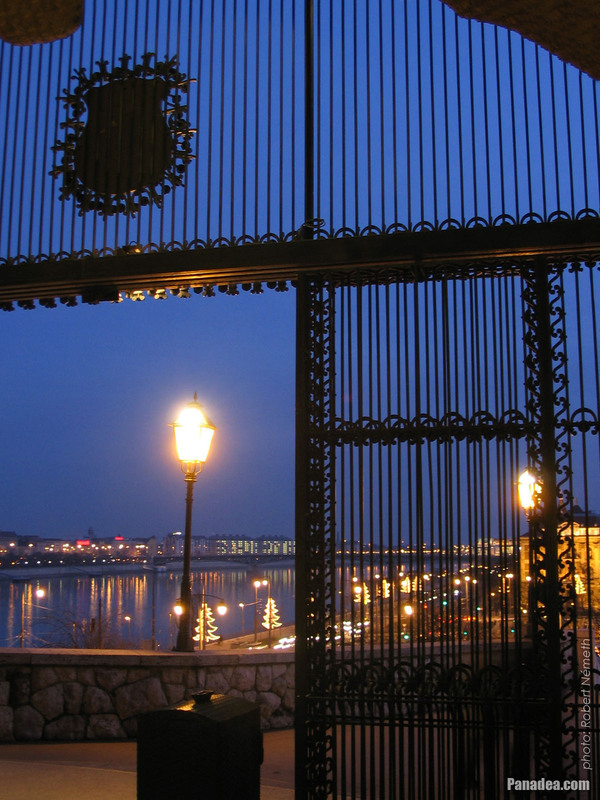 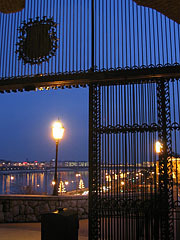 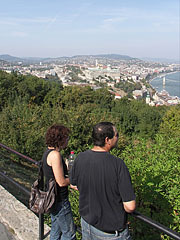 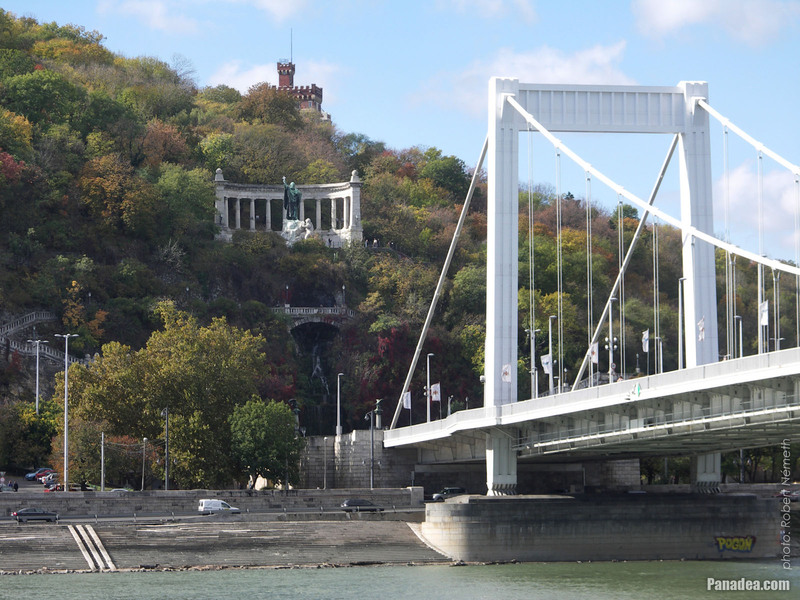 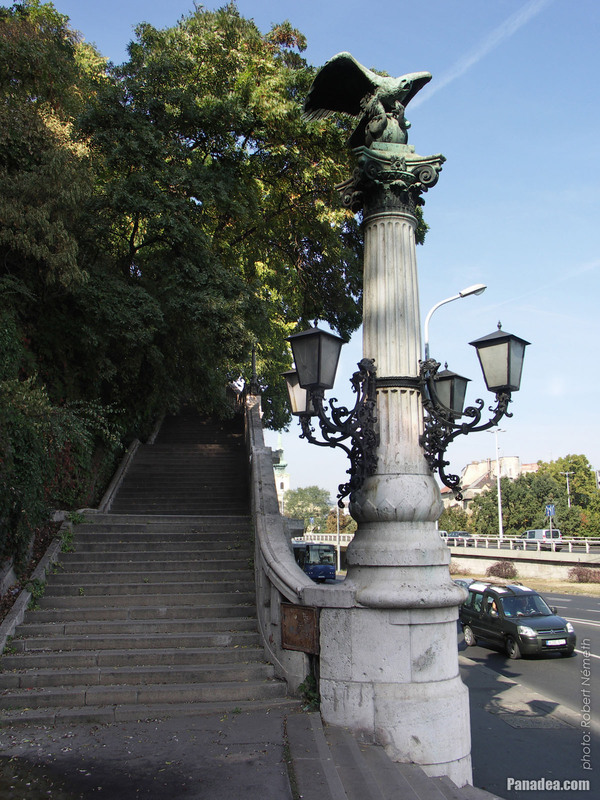 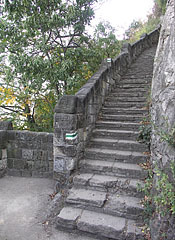 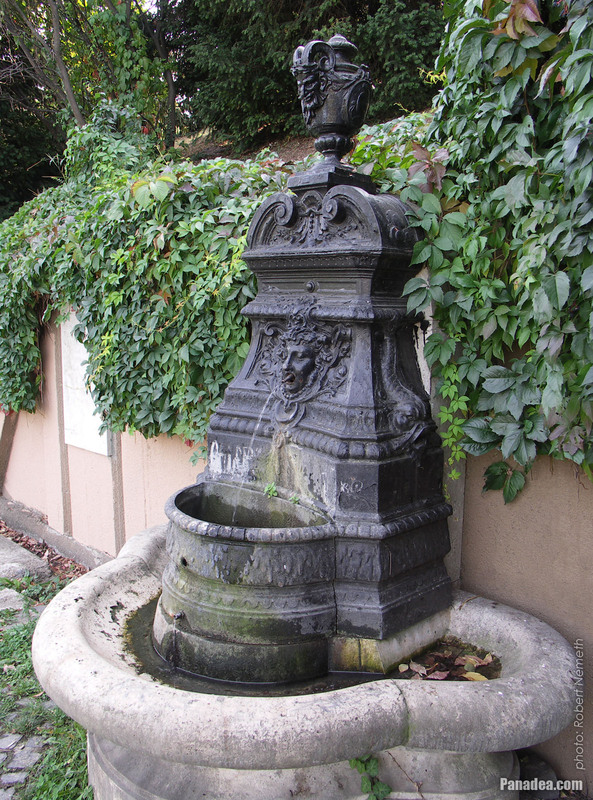 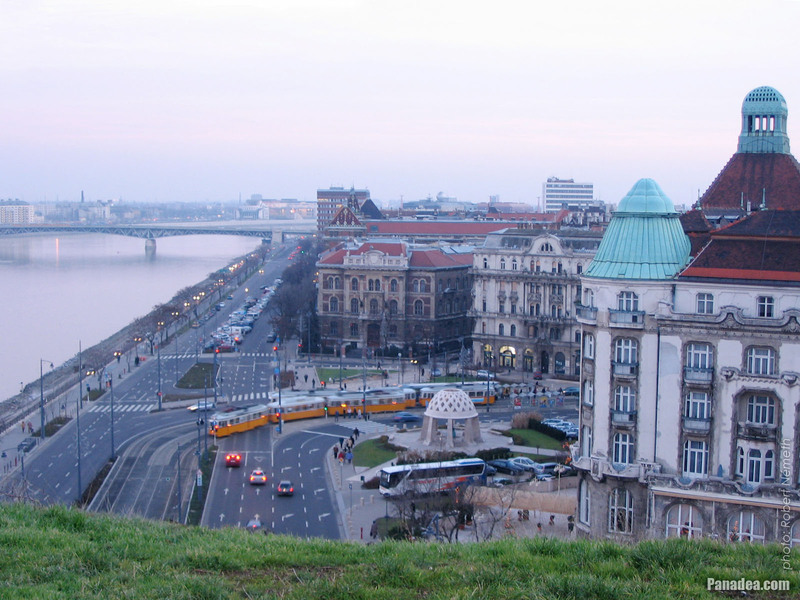 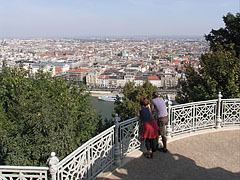 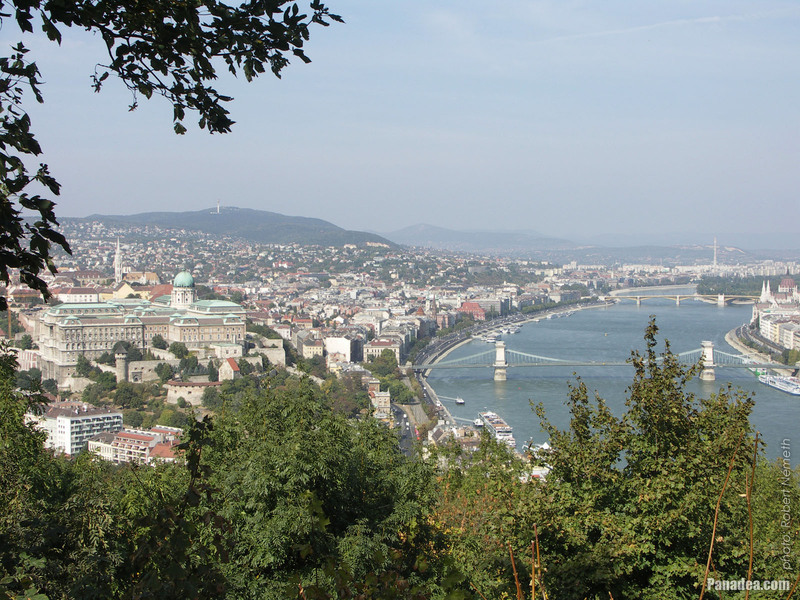 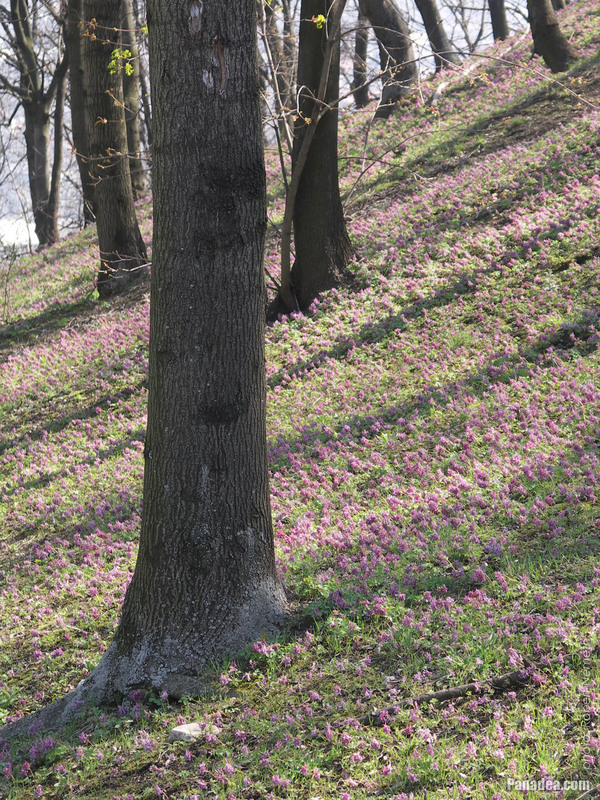 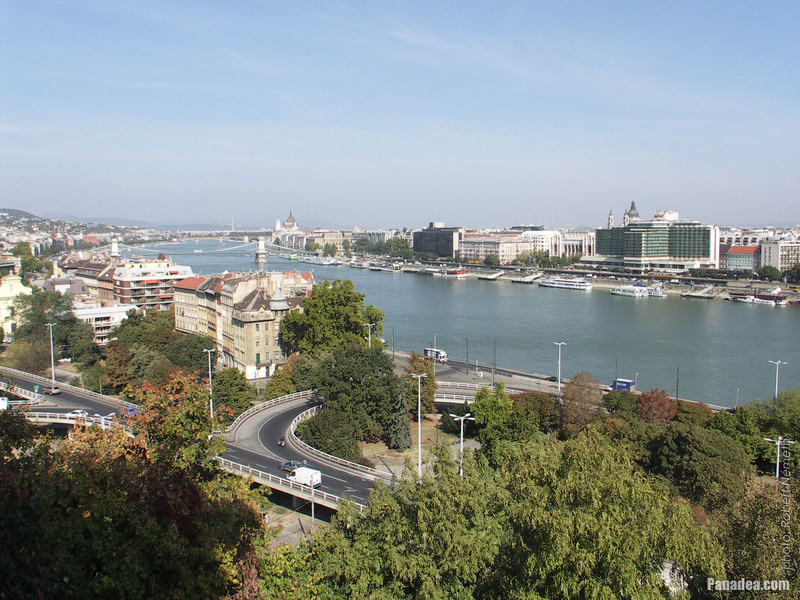 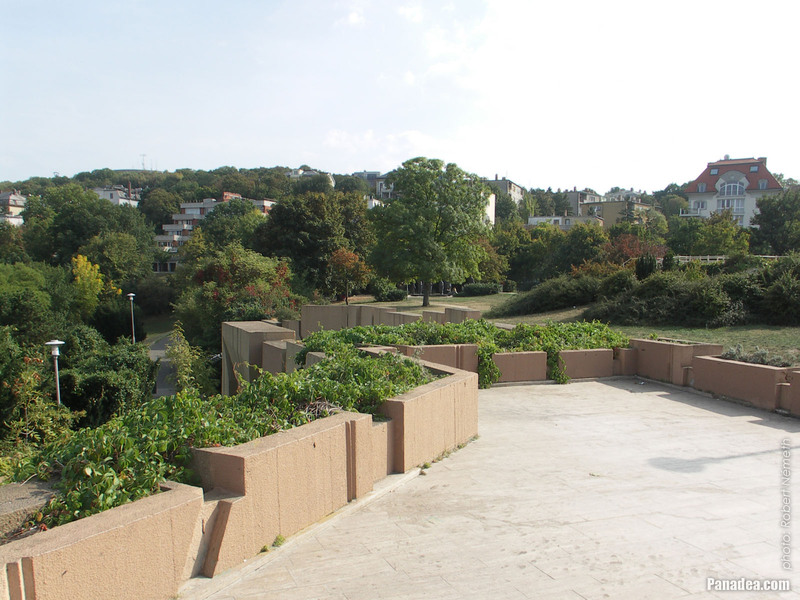 There is an ornate wall drinking fountain on the northern slope of the Gellért Hill and close to the water reservoir. 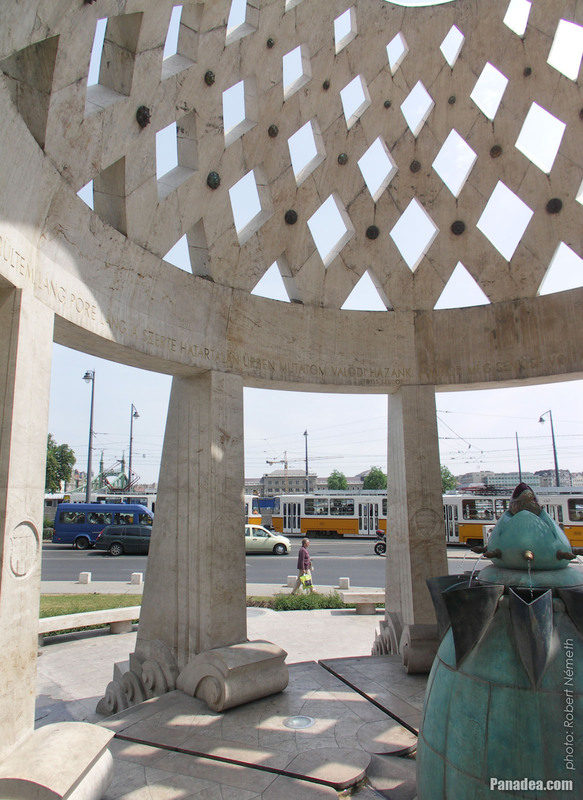 It was located originally in Terézváros quarter (6th district), at 86 Király Street on the yard of a dwelling house, it was moved to its current place in 1981. 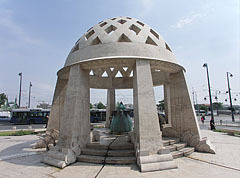 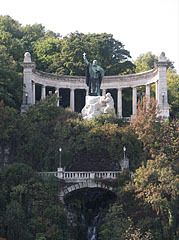 The fountain was set by the Waterworks of Budapest in memory of the old water supply system of the capital city. 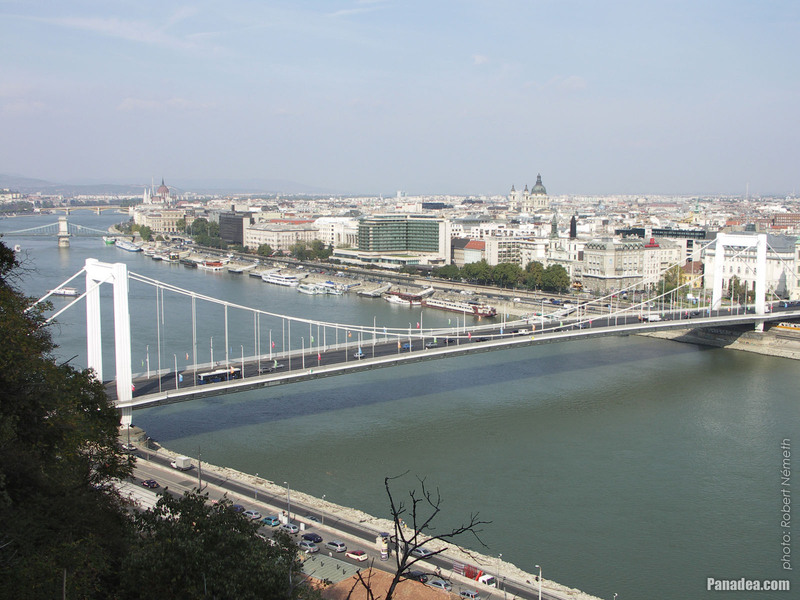 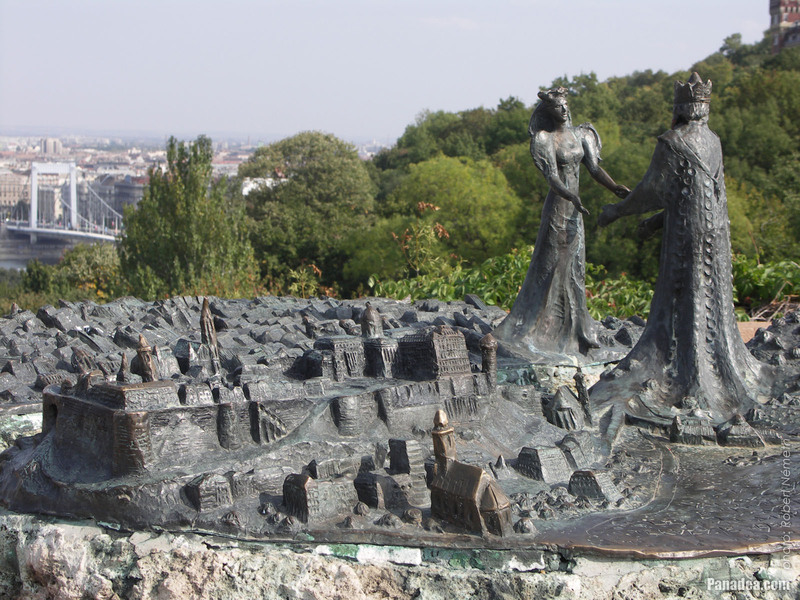 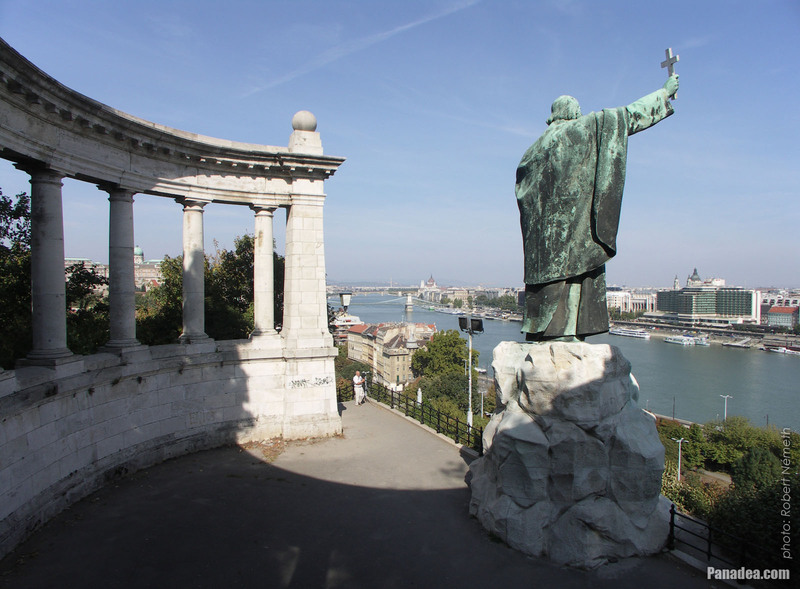 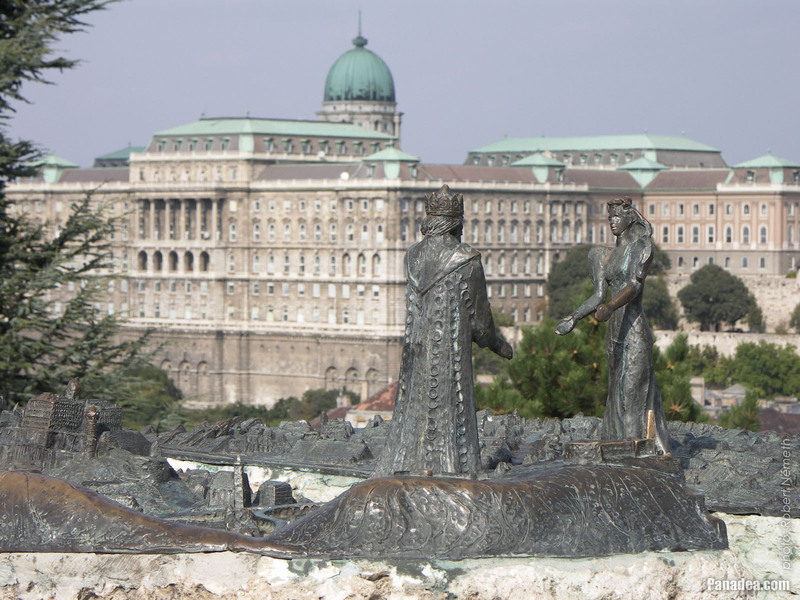 The bronze sculpture on the north side of the Gellért Hill over the water reservoir is the stylized relief model of Budapest city, on the banks of the imaginary Danube River a royal couple symbolizes the main quarters, Buda and Pest. Created by Márta Lesenyei sculptor in 1982. 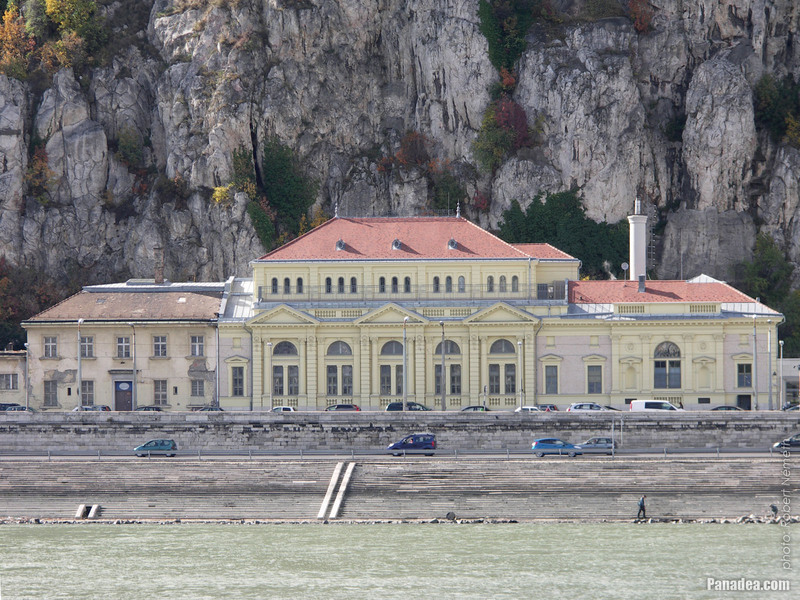 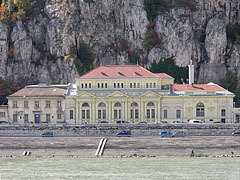 It was built in 1904, extended between 1974-1980, now with the 80 000 cubic meters capacity it is the largest artificial water reservoir in Budapest. 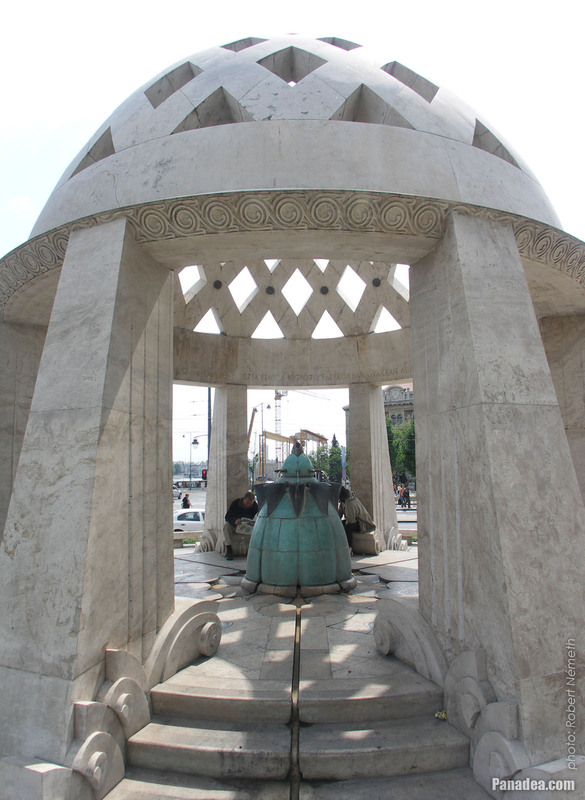 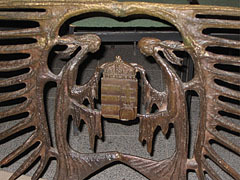 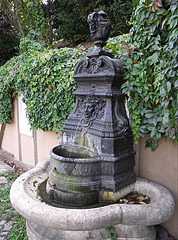 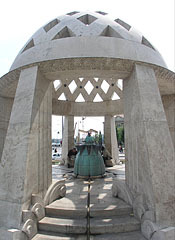 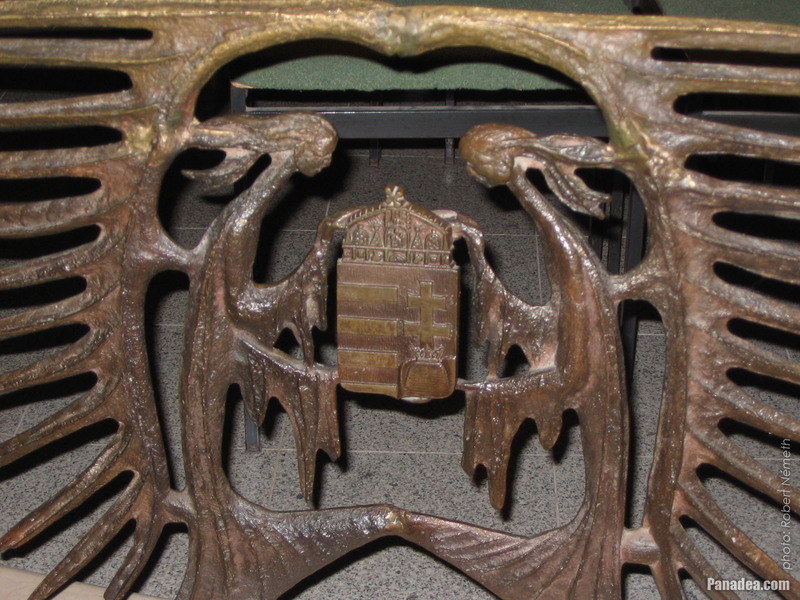 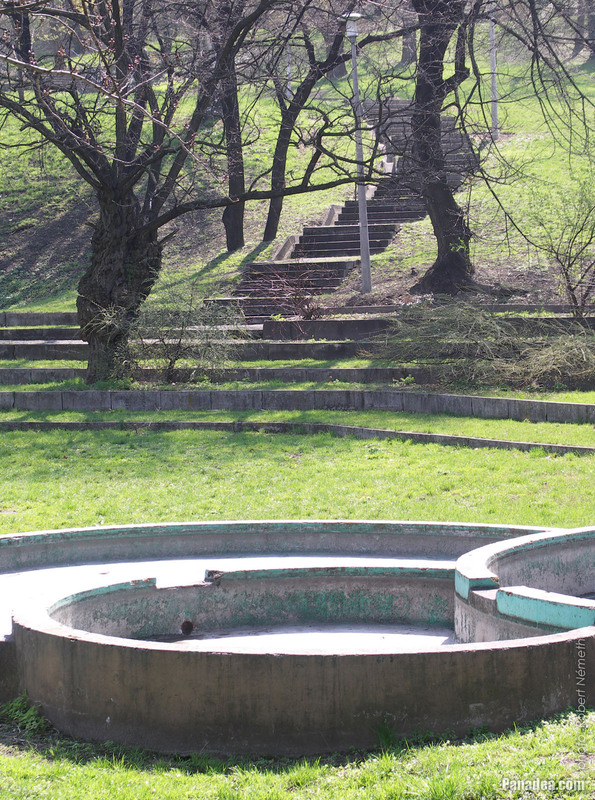 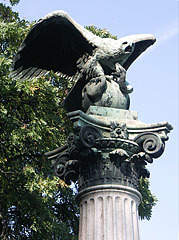 Drinking well in the "Forrásház"
Created by Aladár Gárdos sculptor in 1918. 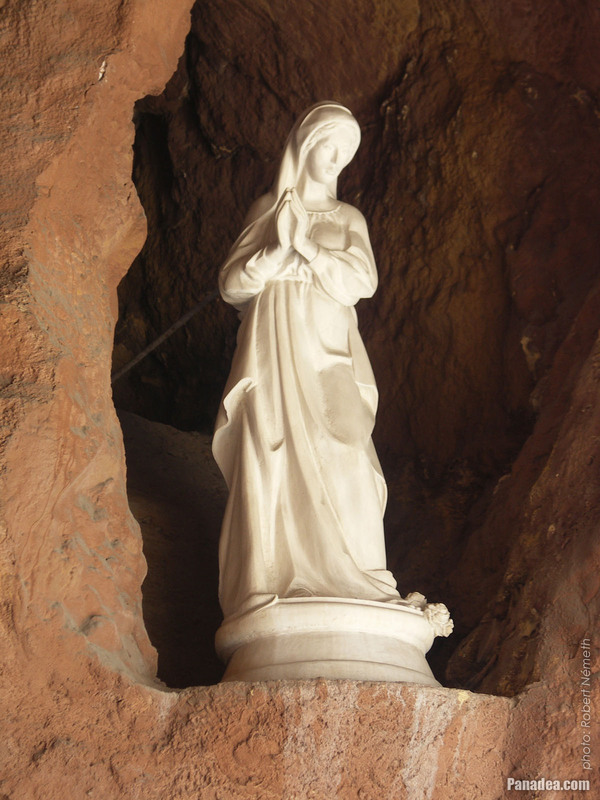 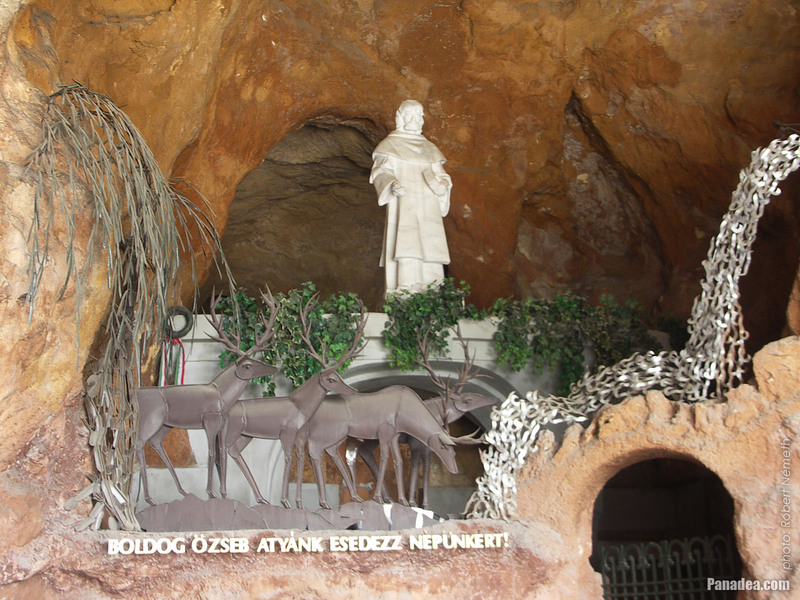 The so-called Polish Chapel was created in honor of the help of the Polish people to the Paulines, the Polish-Hungarian friendship and the common Christian saints of the two nations, as well as in memory of the Polish people who found a shelter in the cave church in the World War II. 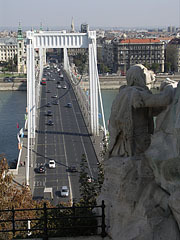 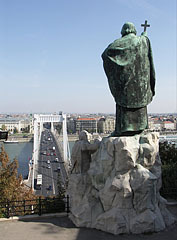 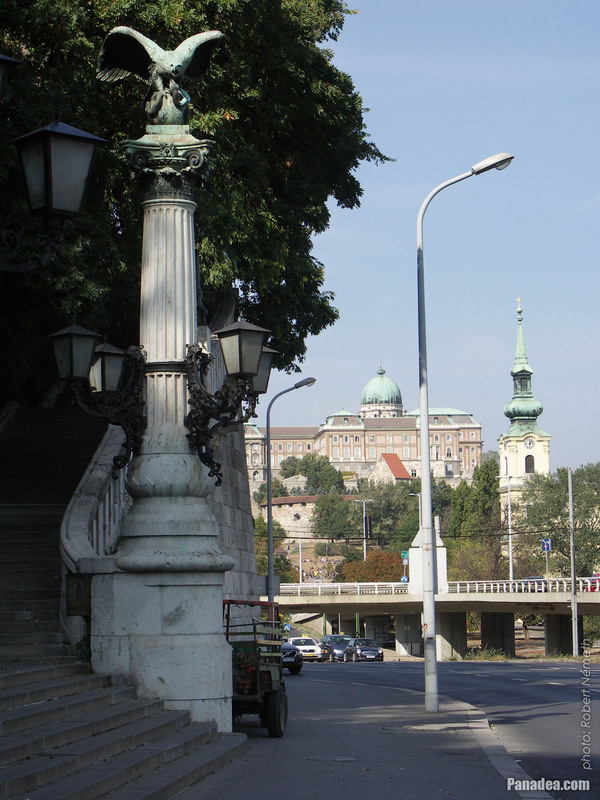 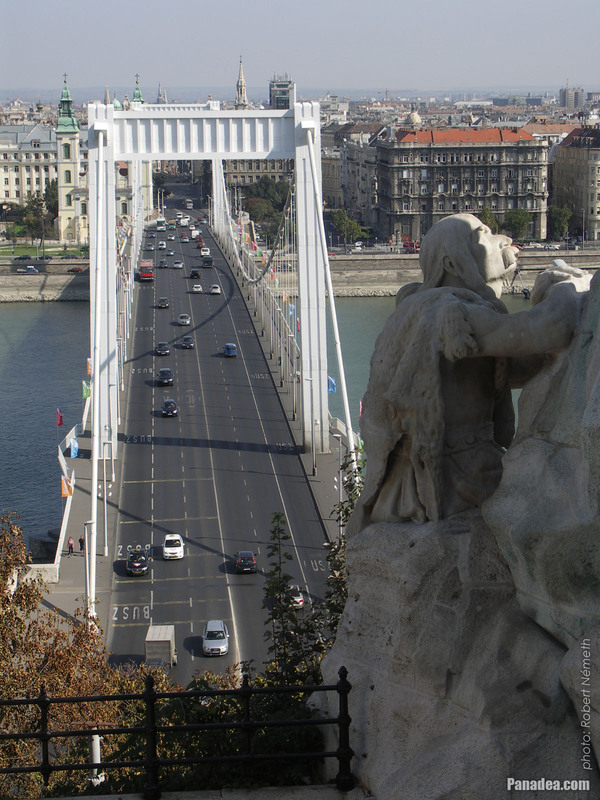 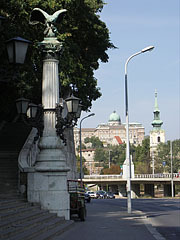 The statue of Bishop St. Gerard Sagredo or St. Gellért who holds up a cross towards Pest, it is situated on the east side of the hill that is named after the saint, at the Buda-side end of the Elisabeth Bridge (or "Erzsébet Bridge"). 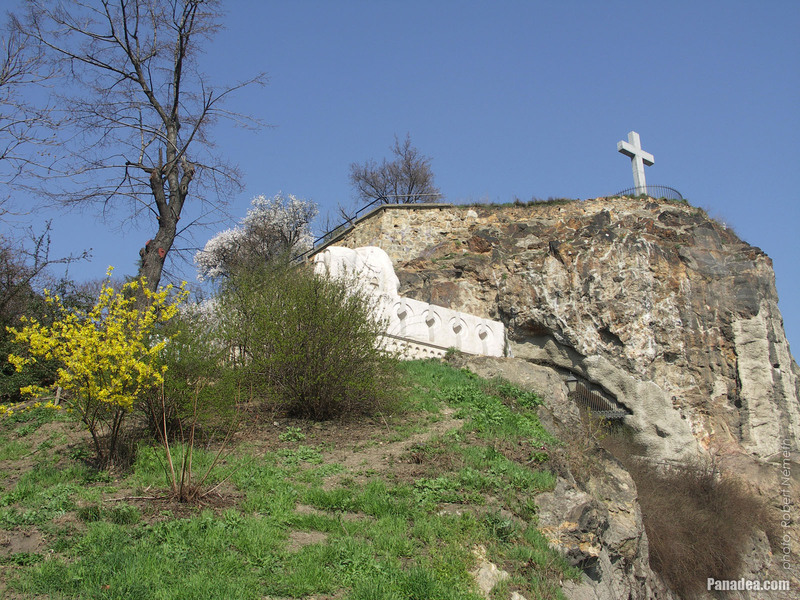 According to the legend exactly this was the site of the missionary priest's martyrdom. 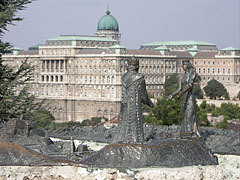 The monumental bronze statue of the bishop is created by Gyula Jankovits in 1904, as well as the limestone statue of the pagan soldier at the foot of St. Gellert is sculpted by Aladár Gárdos. 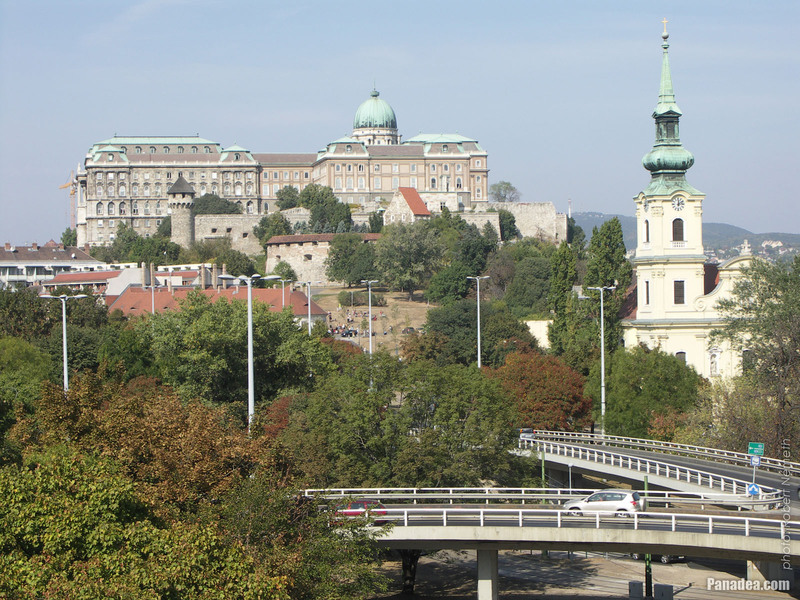 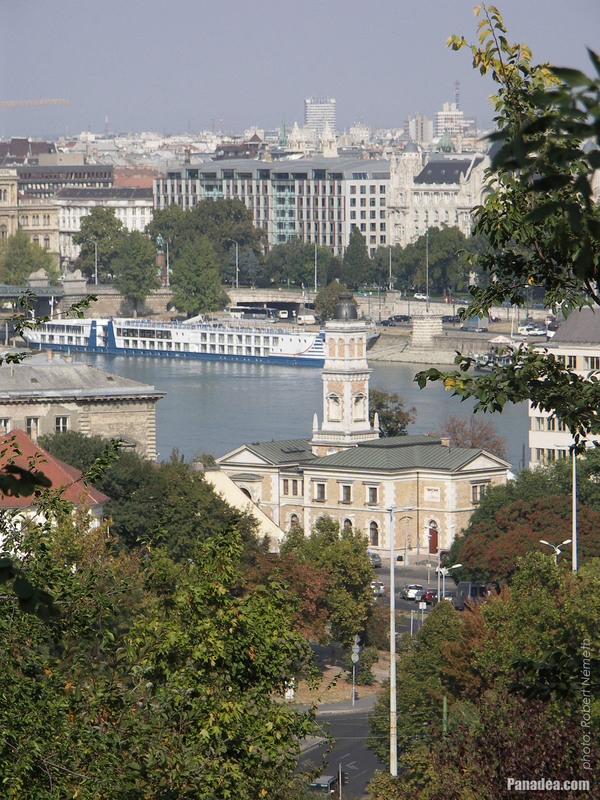 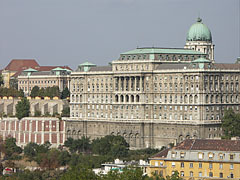 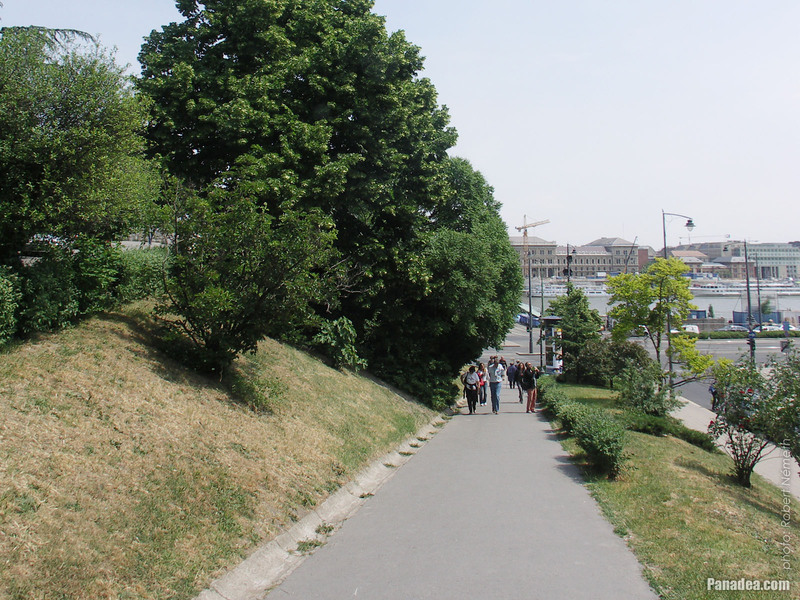 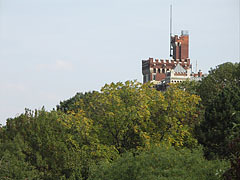 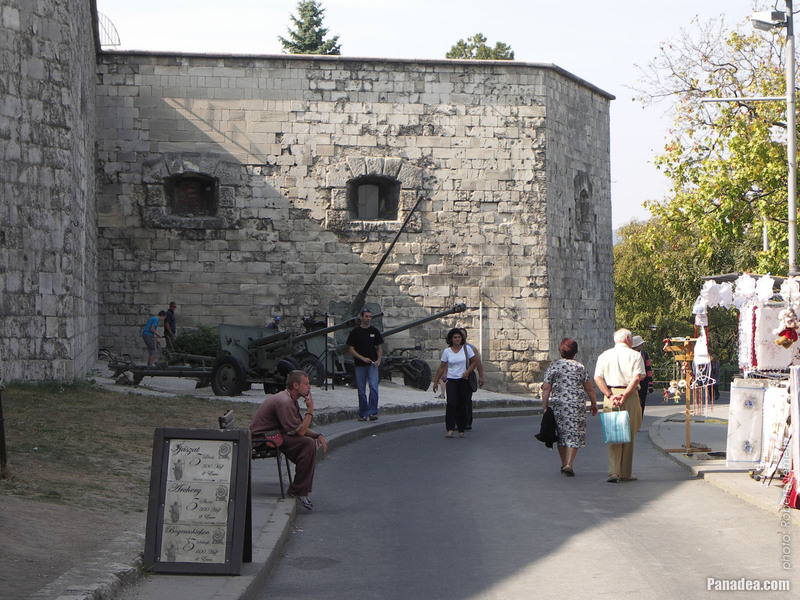 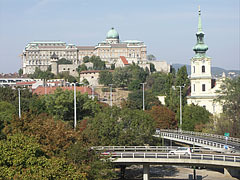 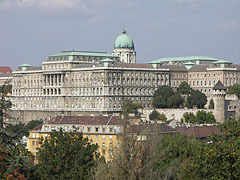 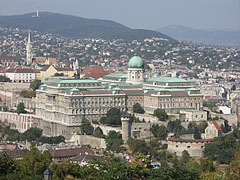 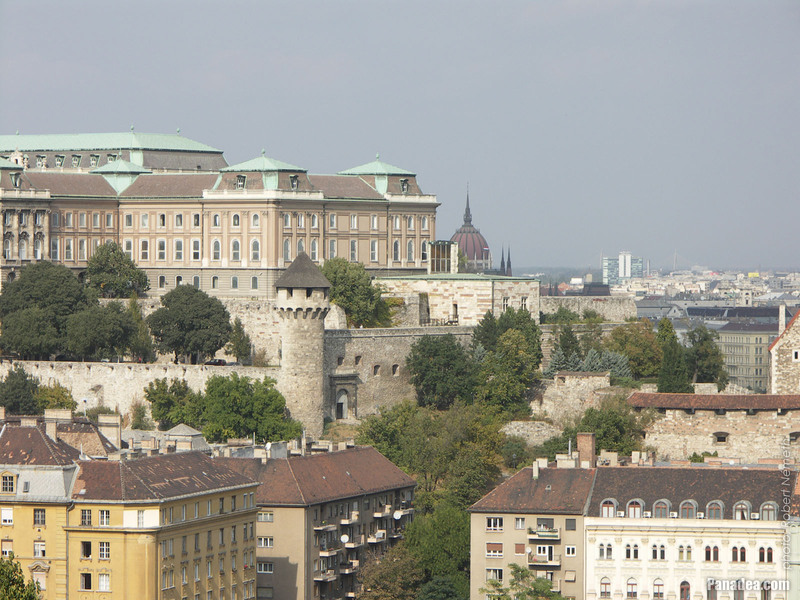 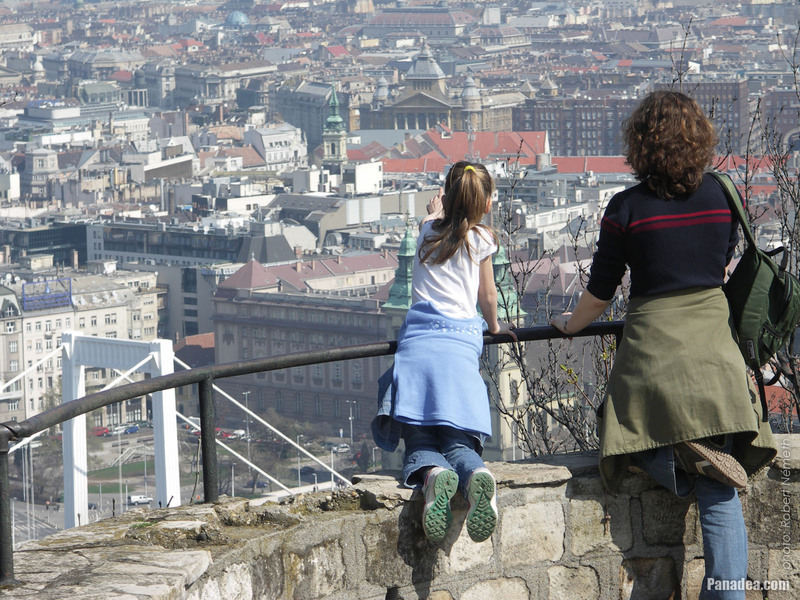 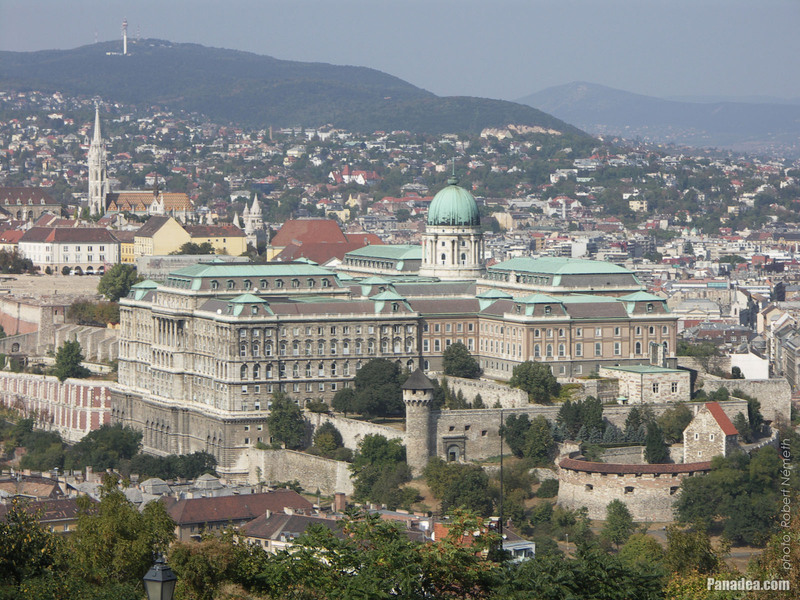 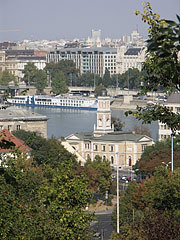 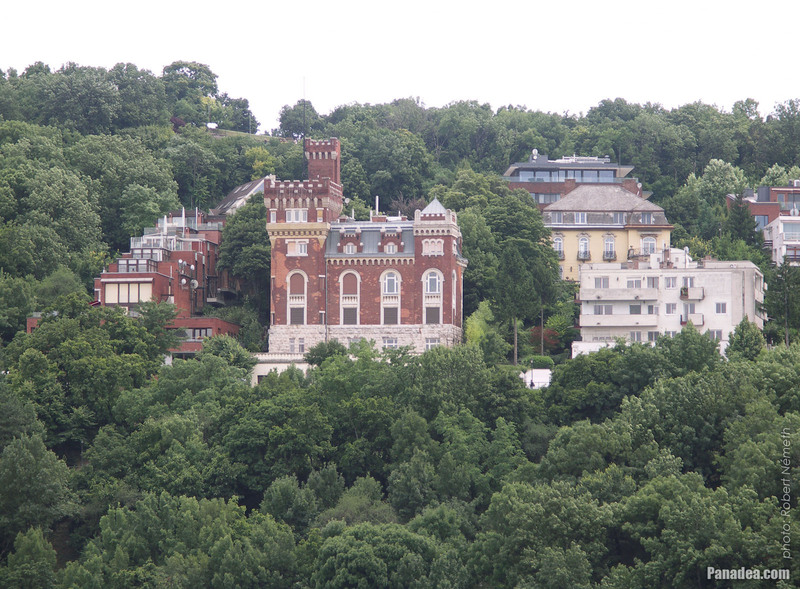 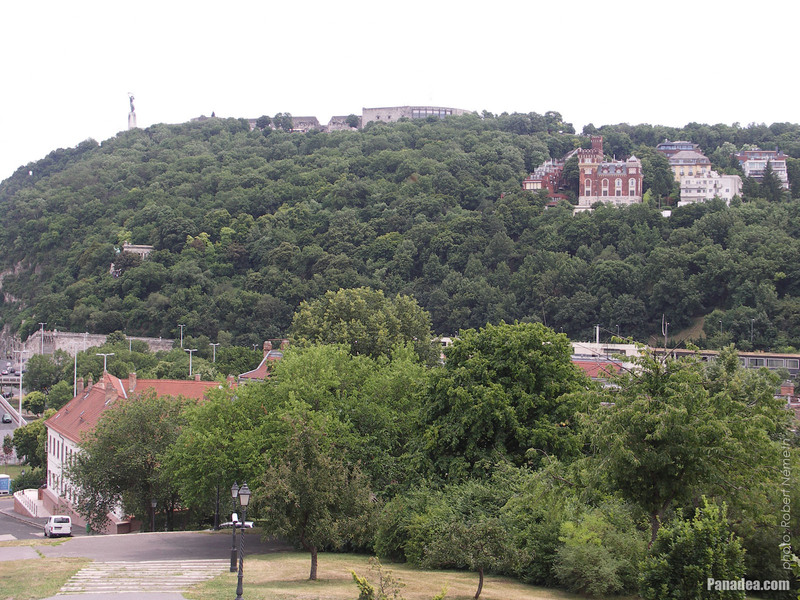 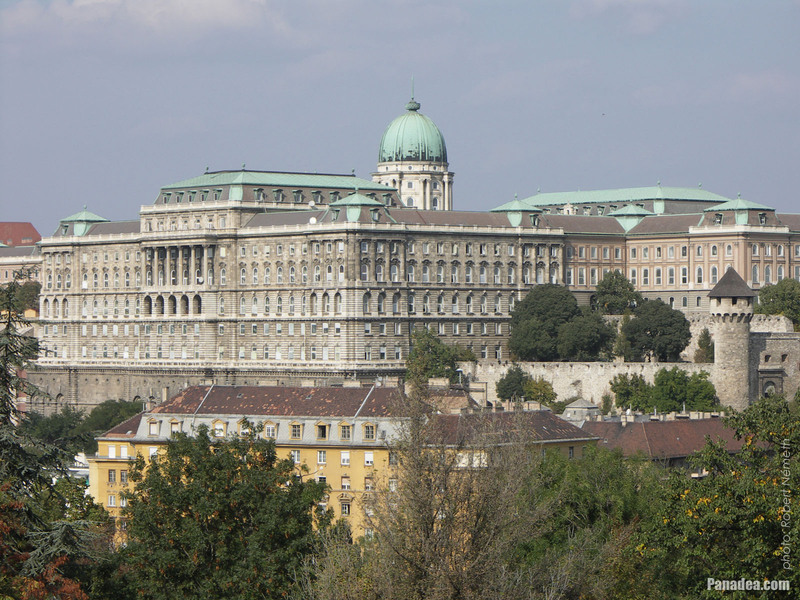 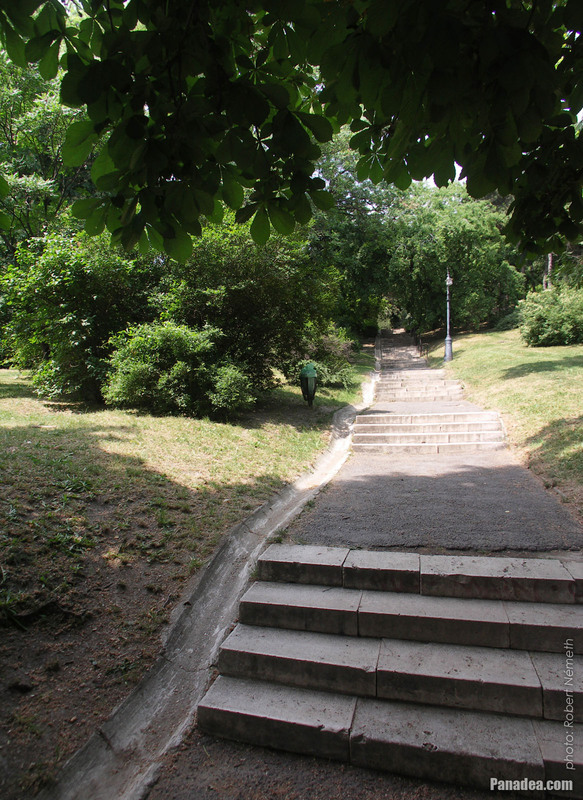 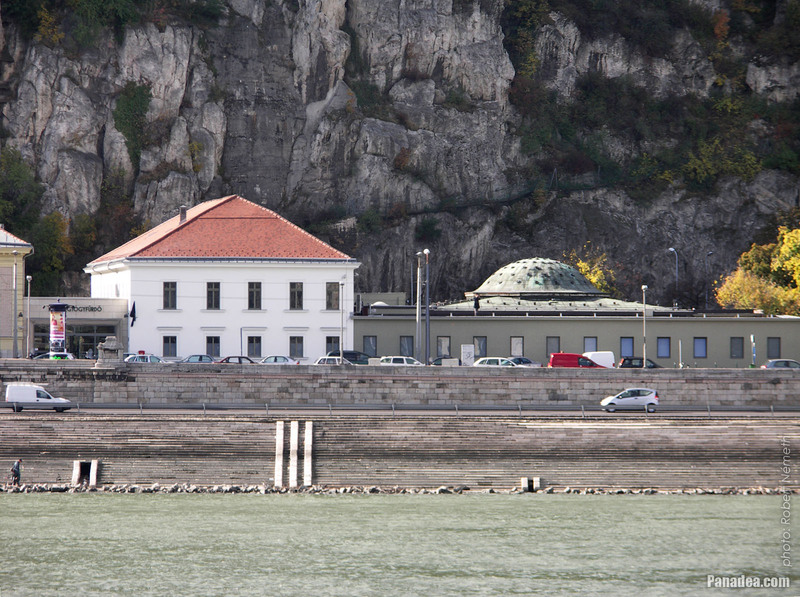 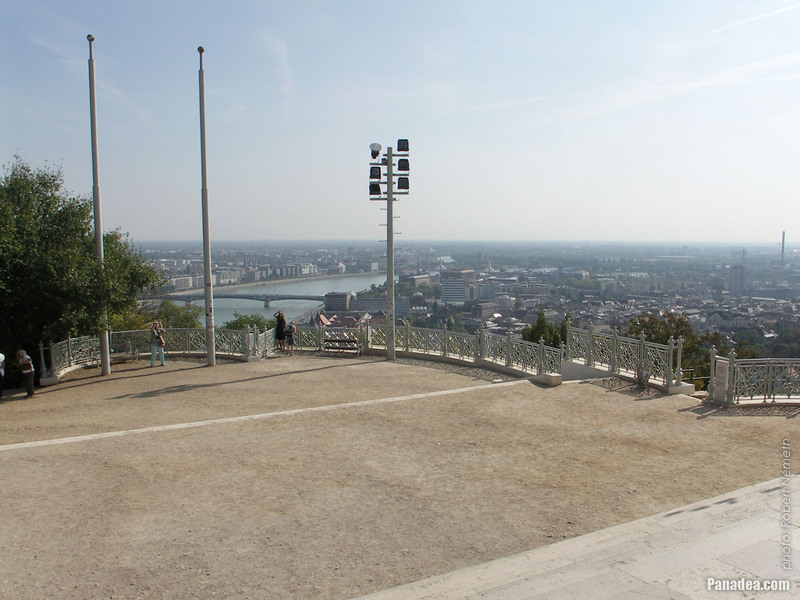 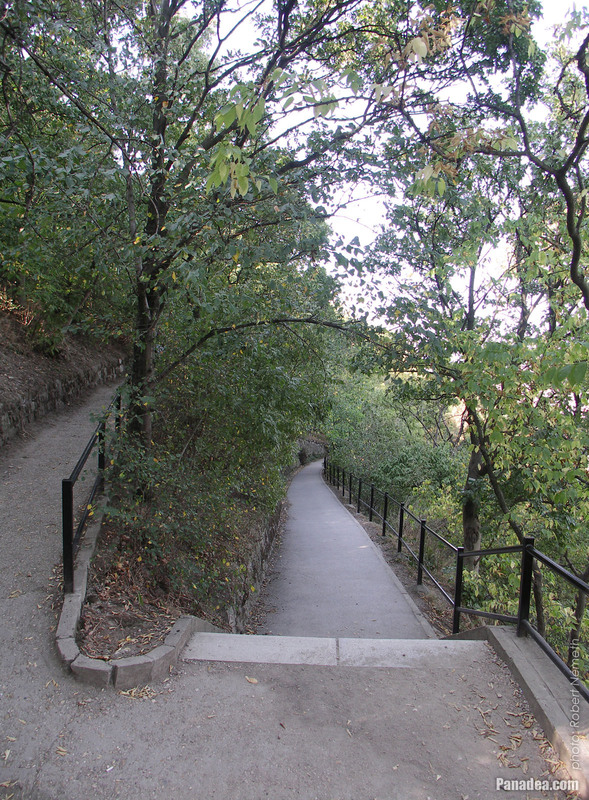 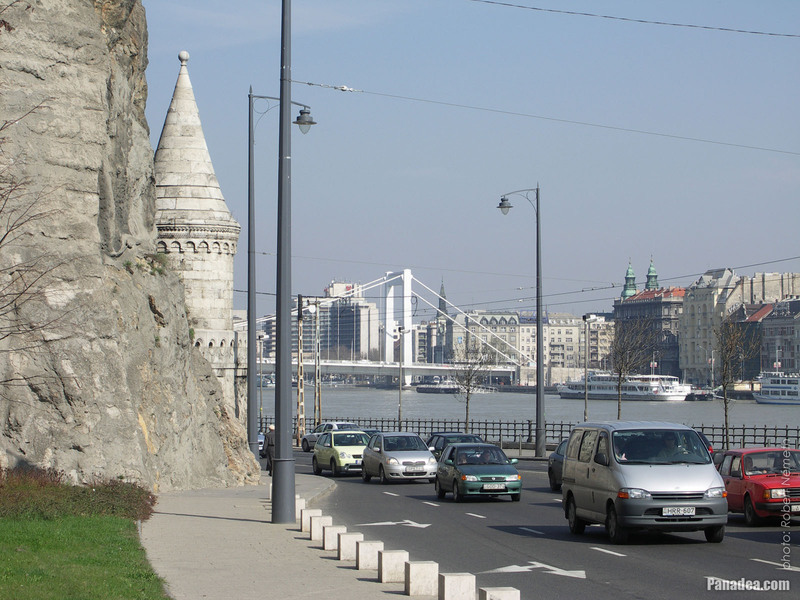 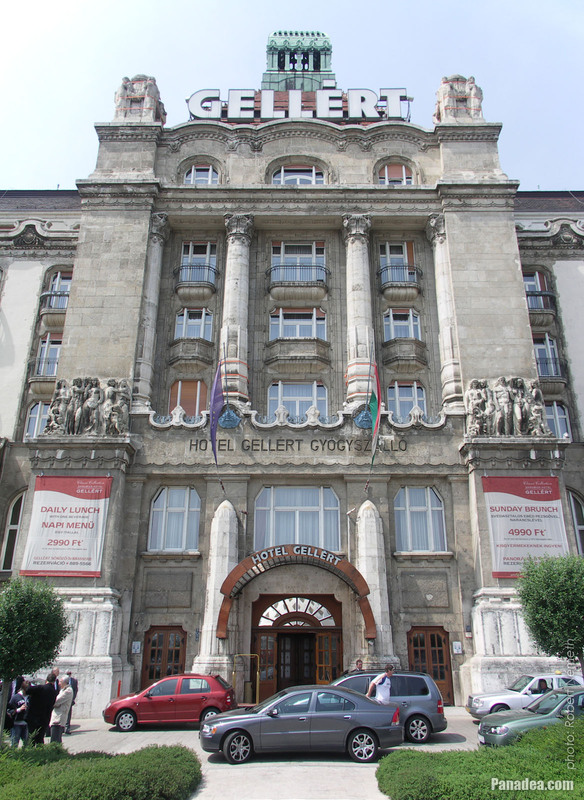 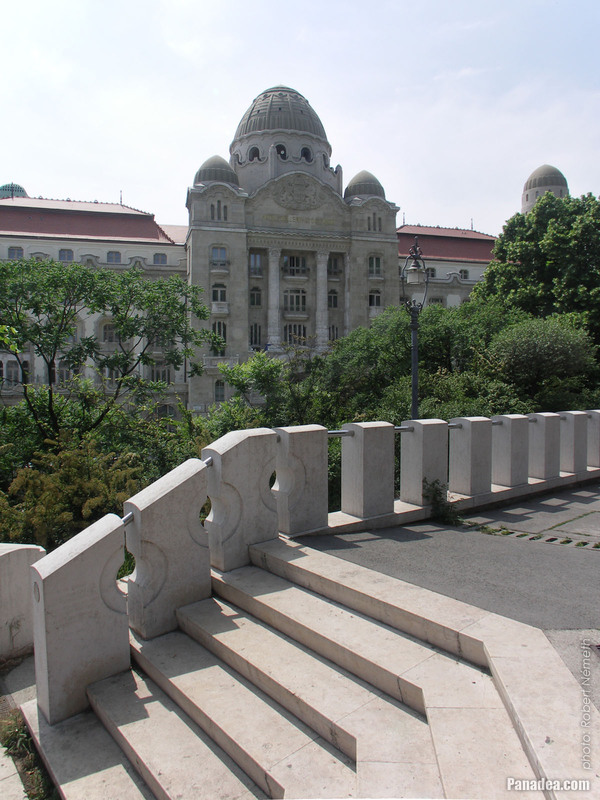 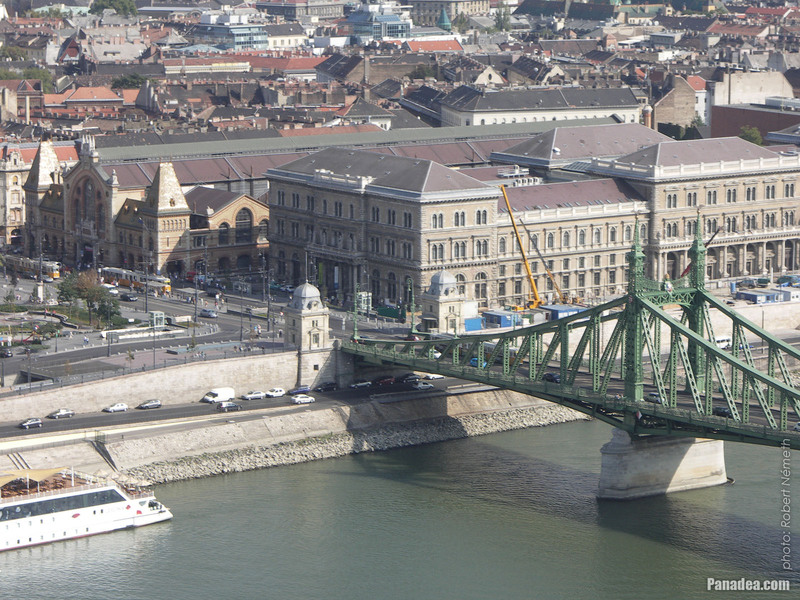 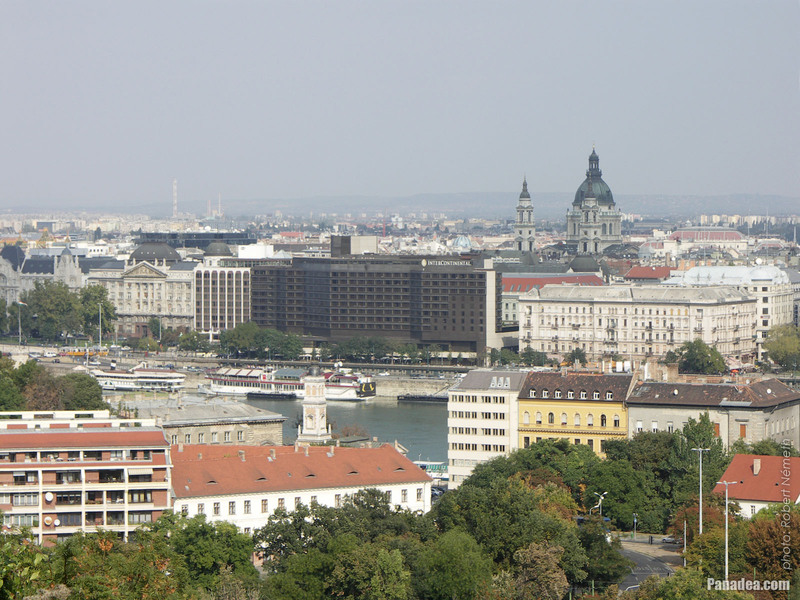 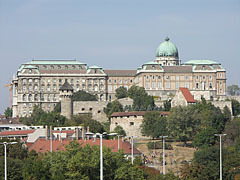 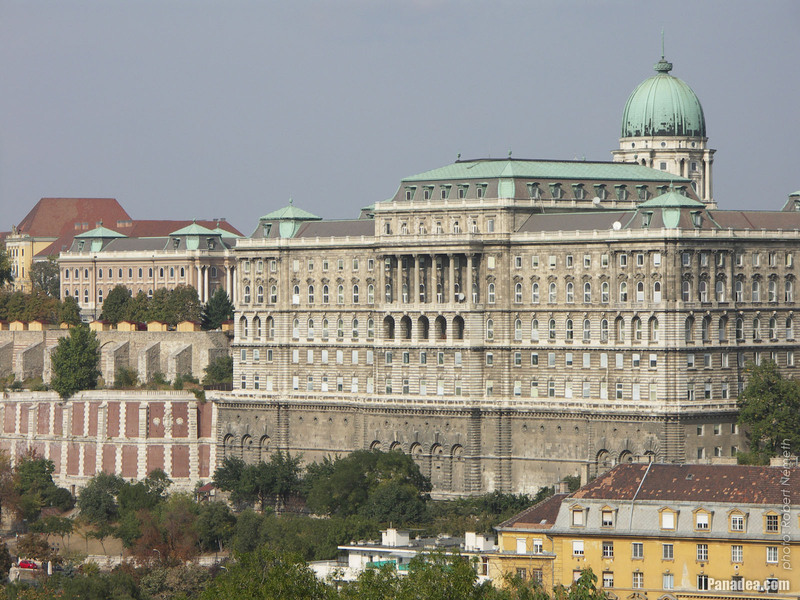 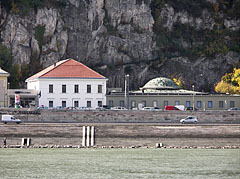 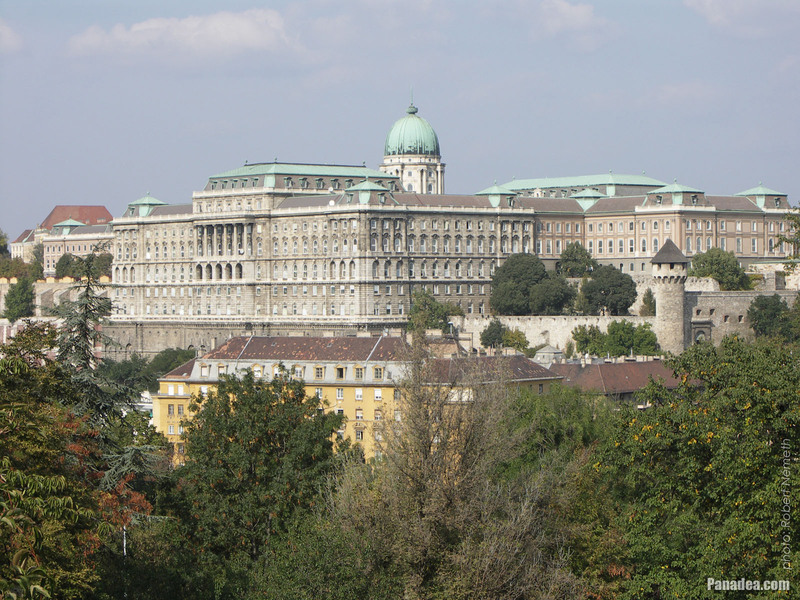 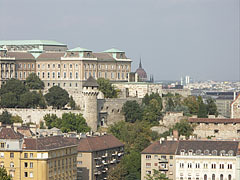 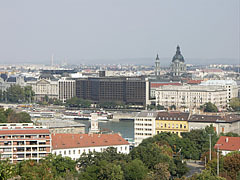 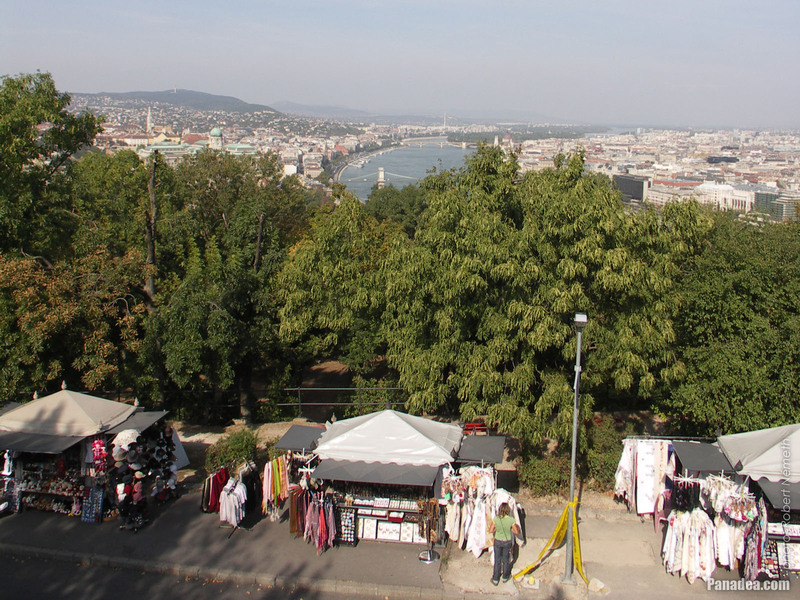 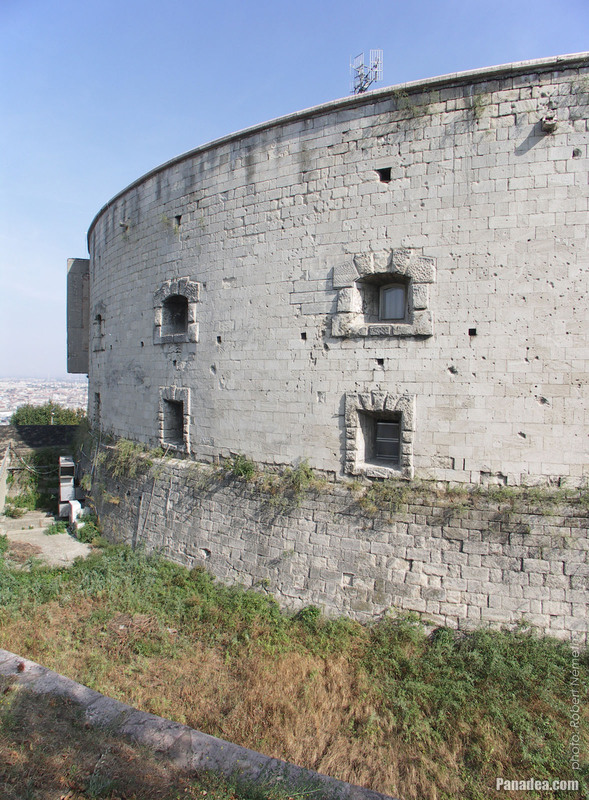 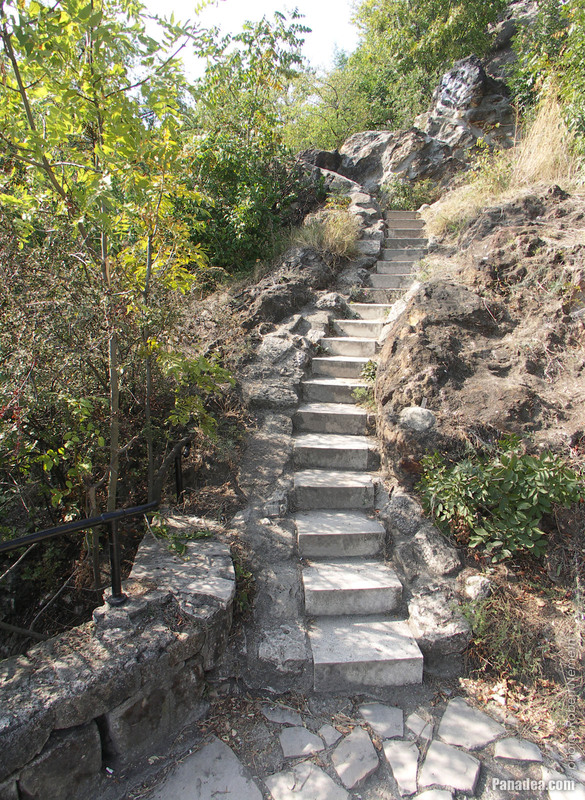 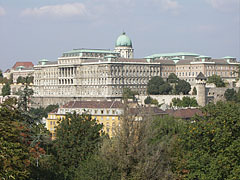 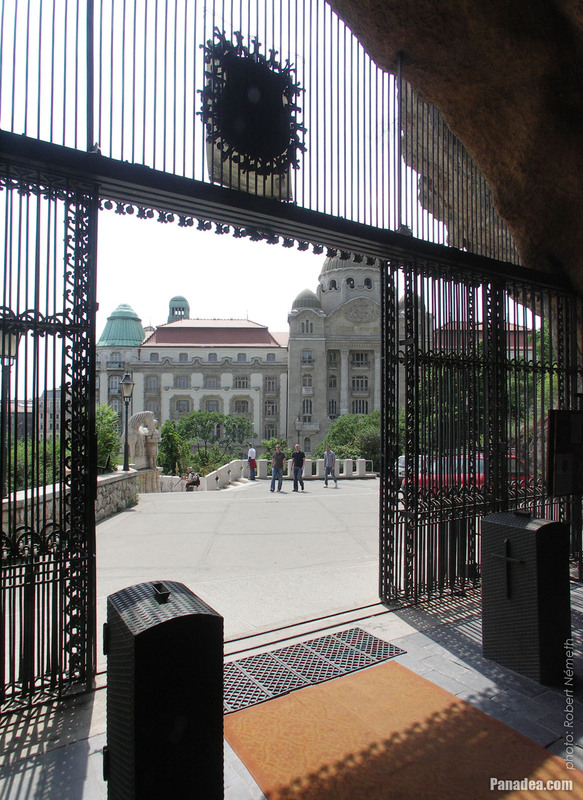 Actually the eastern side of the Gellért Hill is also part of the Tabán quarter, that is reached up to the Citadel. 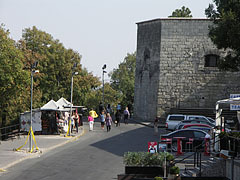 Once Tabán was a standalone settlement, and until the mid-1930s it preserved its urban character. But at this time the houses were demolished to build up a new quarter, but the Second World War intervened. 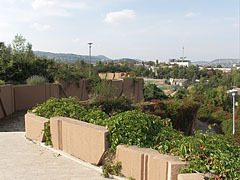 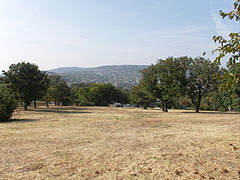 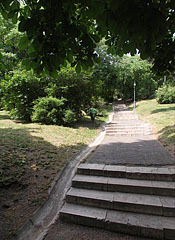 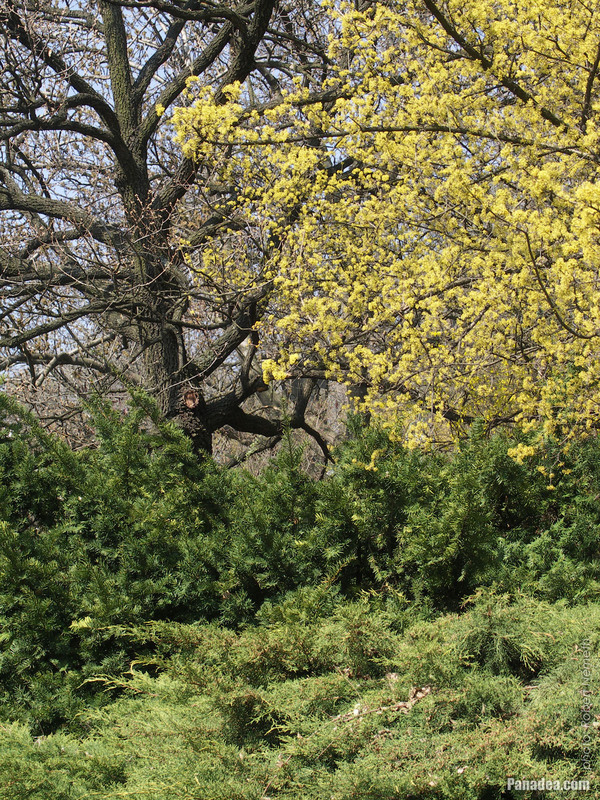 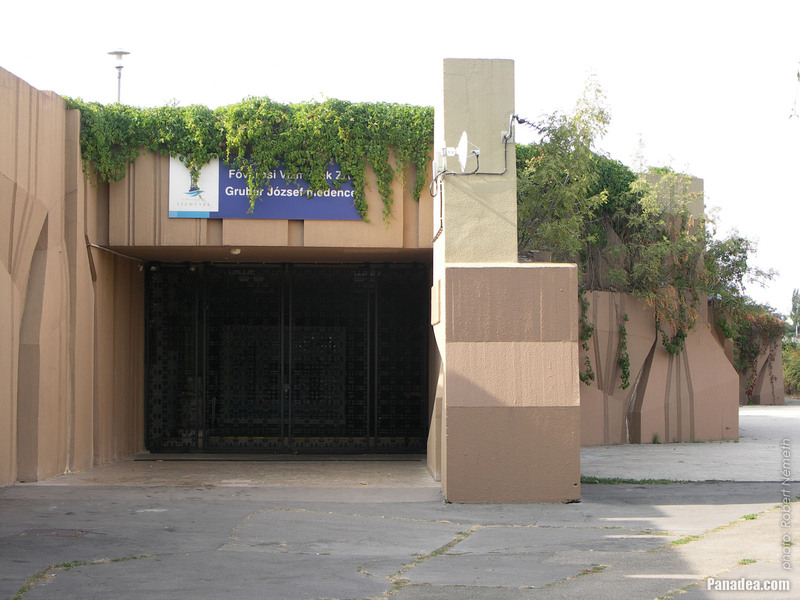 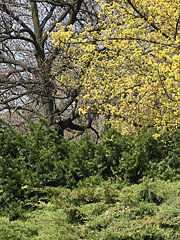 The neglected area was finally landscaped in the 1960s. 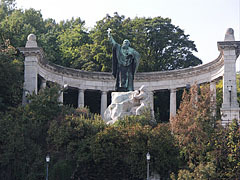 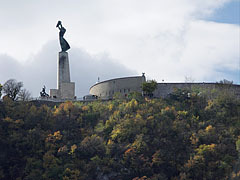 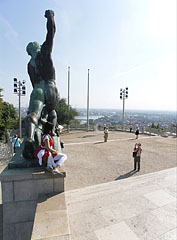 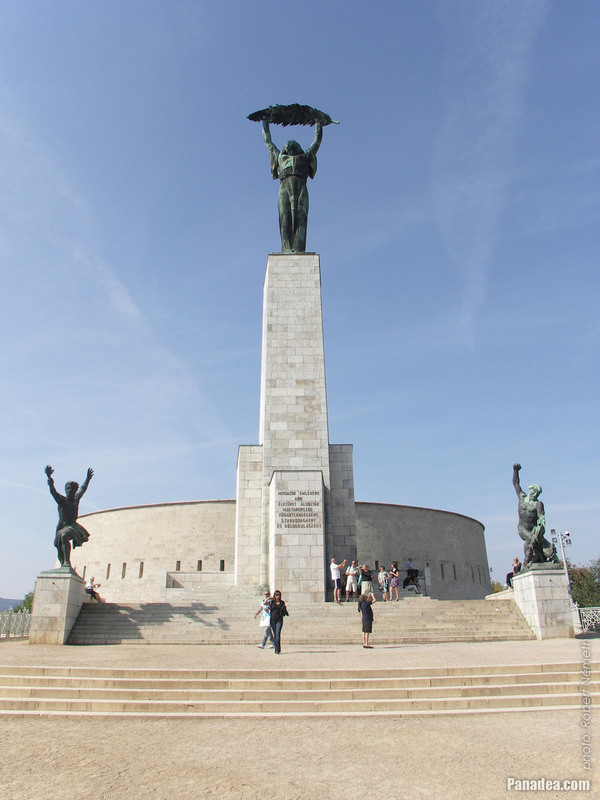 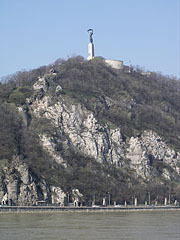 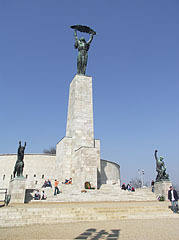 The bronze figure of the St. Gellert or St. Gerard statue on the Gellért Hill is alone 7 meters tall, but together with the limestone pedestal it is more than 11 meters high. 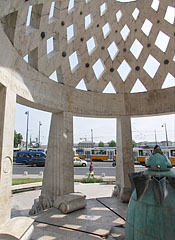 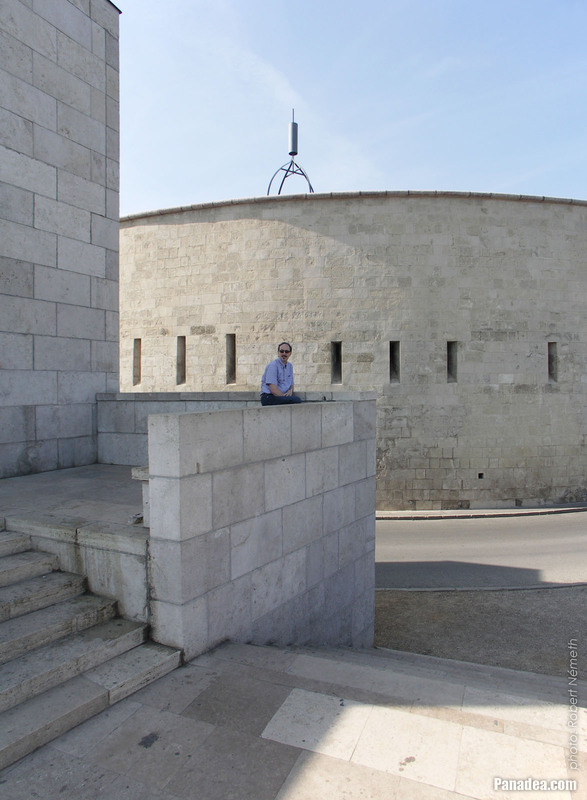 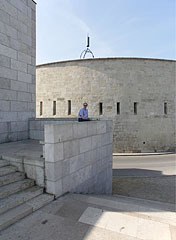 The semi-circular colonnade behind the sculpture group is designed by Imre Francsek. 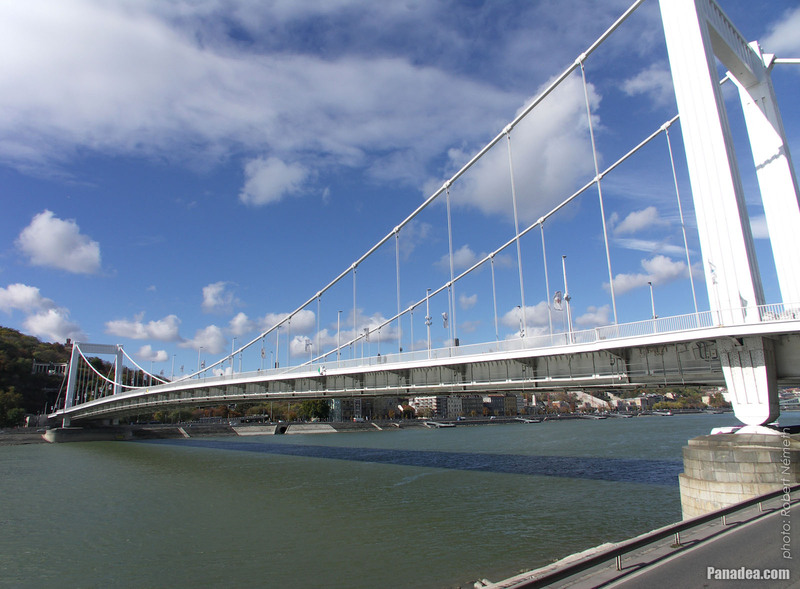 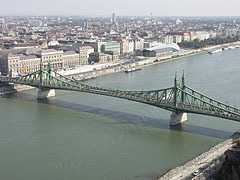 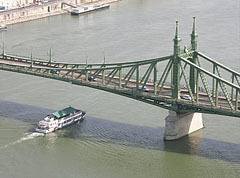 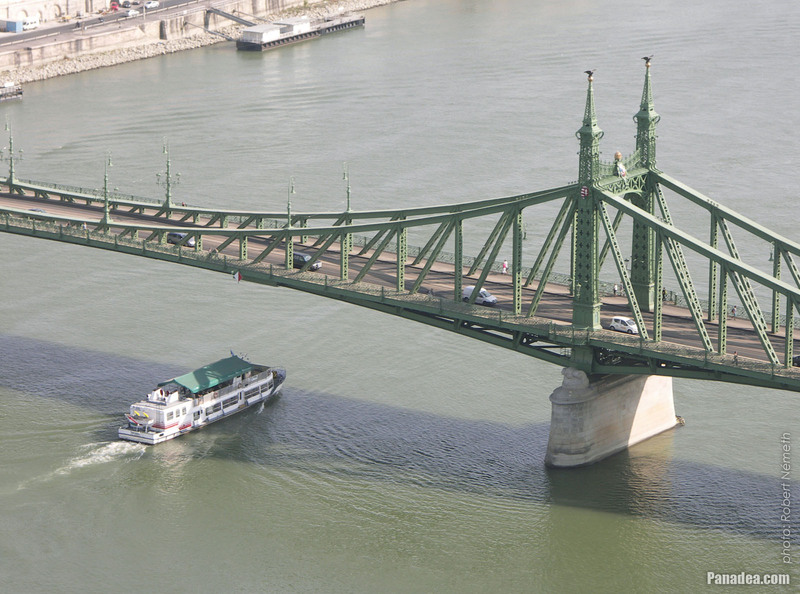 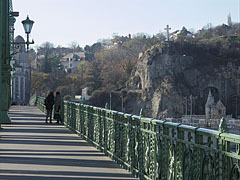 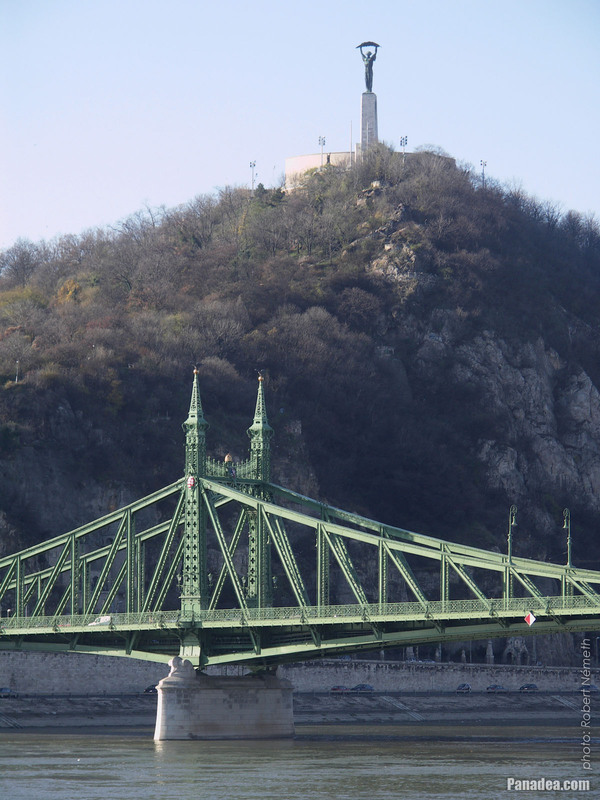 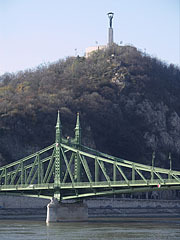 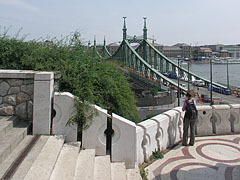 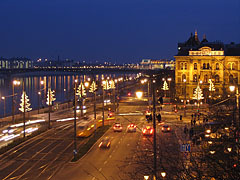 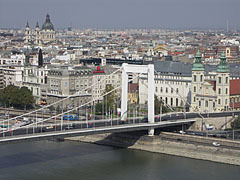 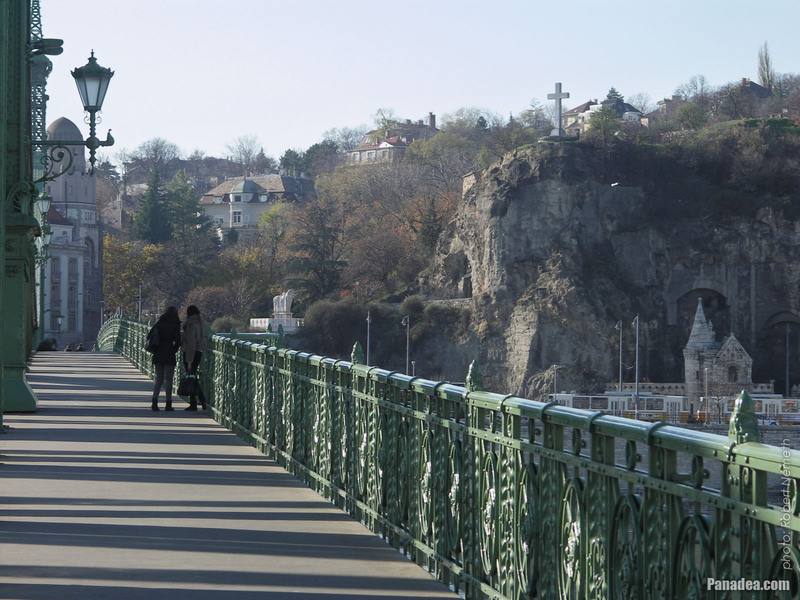 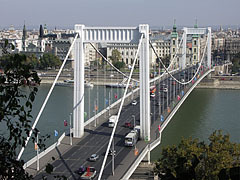 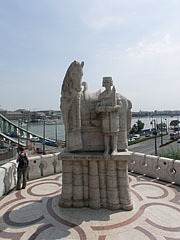 The memorial of St. Gellért is facing to the Elisabeth Bridge over the Danube since 1904 (but of course that was the first Elisabeth Bridge, which was blown up by the German troops in the World War II). According to the tradition the Venetian-born bishop St. Gellért or St. Gerard Sagredo (in Italian Giorgio Sagredo) was the teacher and mentor of Saint Emeric ("Szent Imre") Prince of Hungary and son of King St. Stephen of Hungary, although this has not been substantiated by historical research. 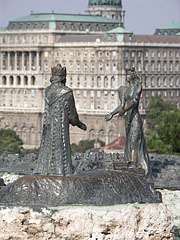 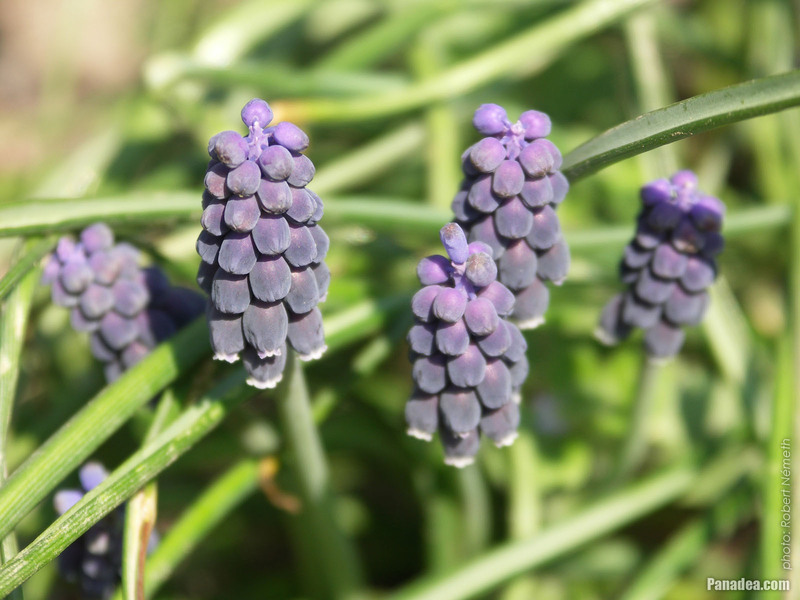 Otherwise it is almost sure that Prince Emeric (Imre) and the bishop knew each other. 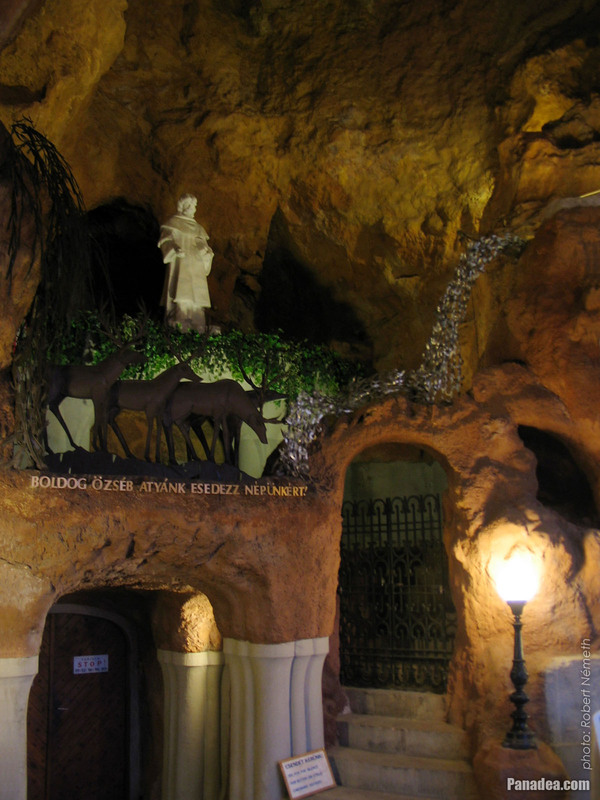 The death of St. Gerard was caused by the pagan mob, the bishop who propagated the Christianity was rolled down the Kelen Hill from a rock in a spiked barrel or maybe in a two-wheeled barrow. 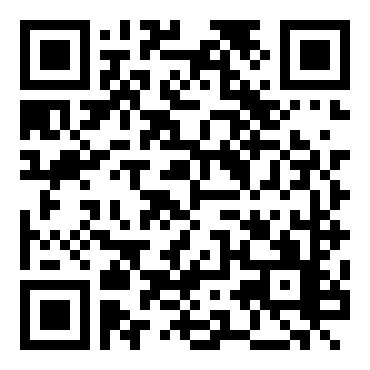 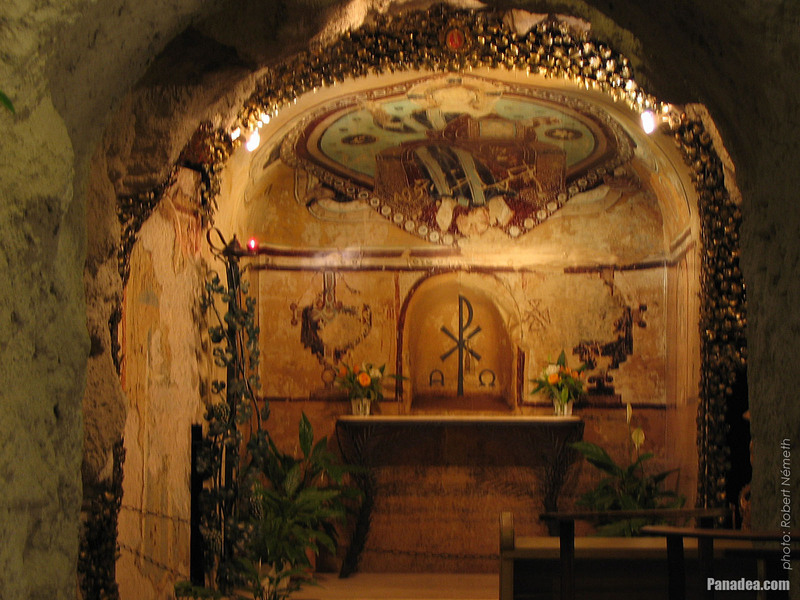 That's how the bishop became martyr and the eponym of the hill. 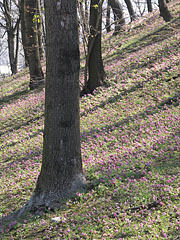 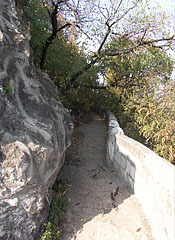 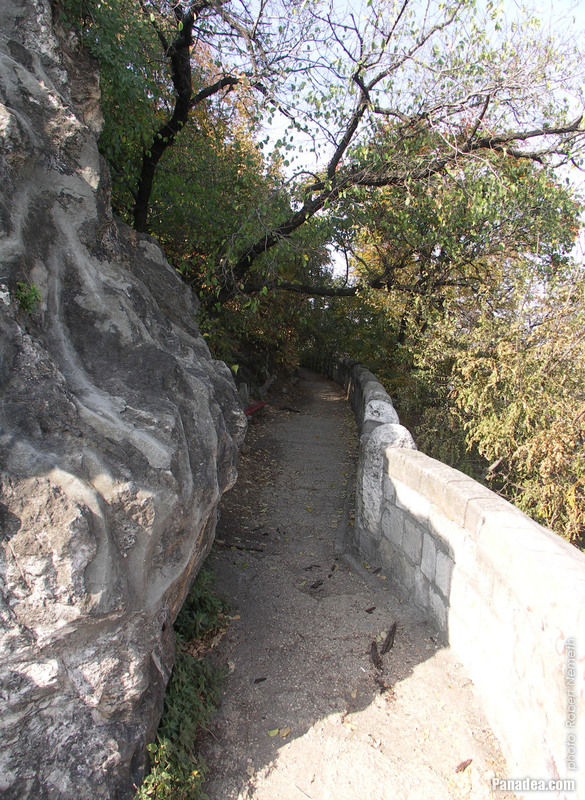 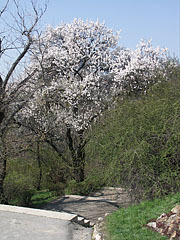 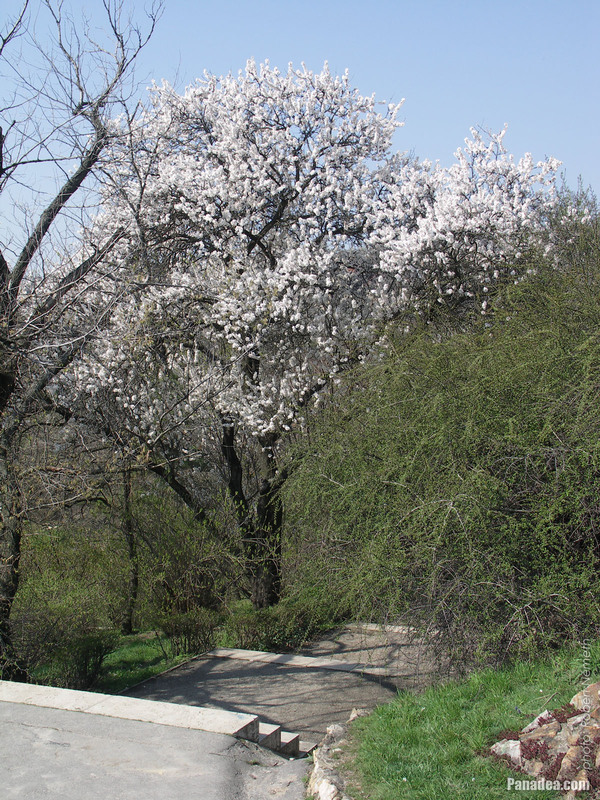 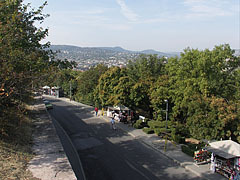 The old name of the Gellért Hill was Kelen Hill, among others the name of the Kelenhegyi Road on the southern hillside reminds to it. 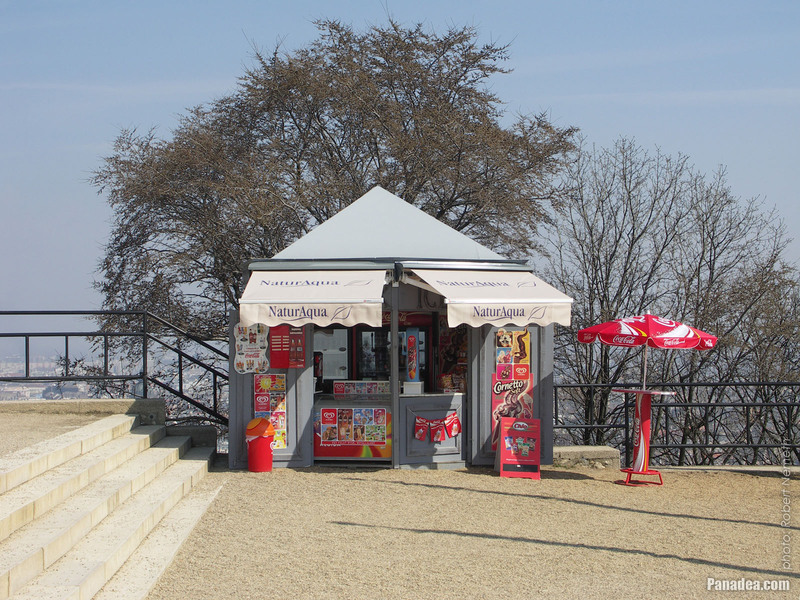 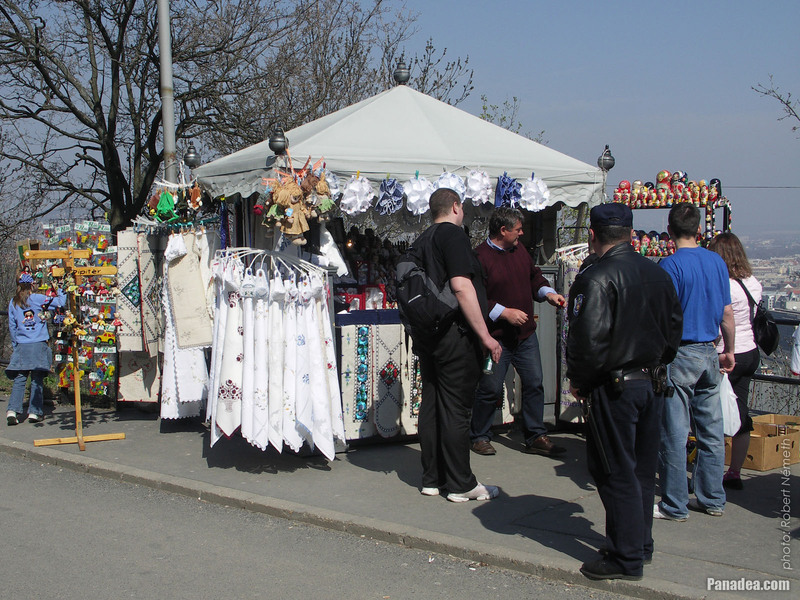 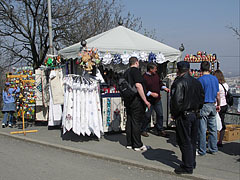 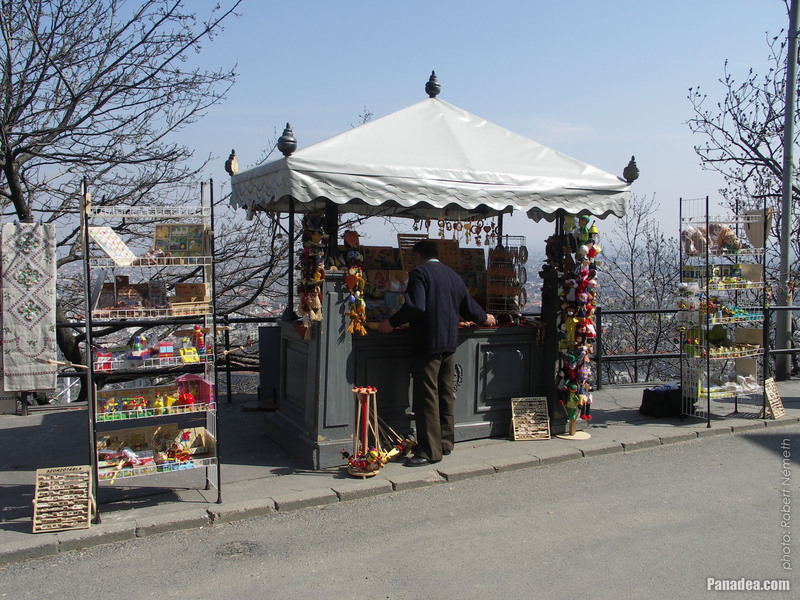 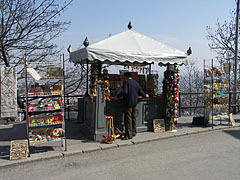 The Royal Garden Kiosk (in Hungarian "Várkert-kioszk", sometimes called Royal Garden Casino) together with the Royal Garden Pavilion or Royal Gardens Bazaar (in Hungarian "Várkert Bazár") were built to have the worthy enclosing of the gardens around the Royal Palace of Buda Castle. 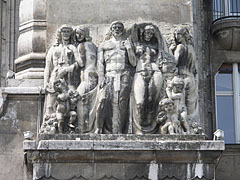 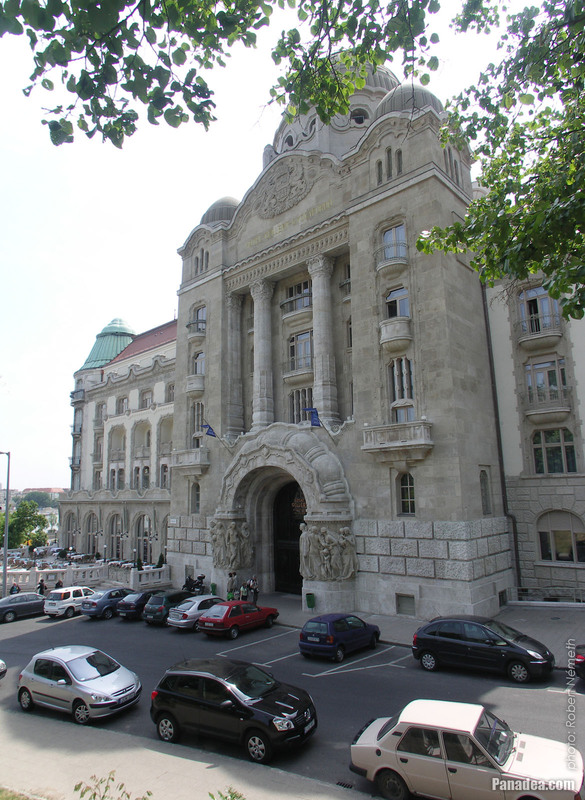 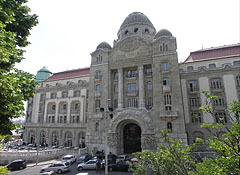 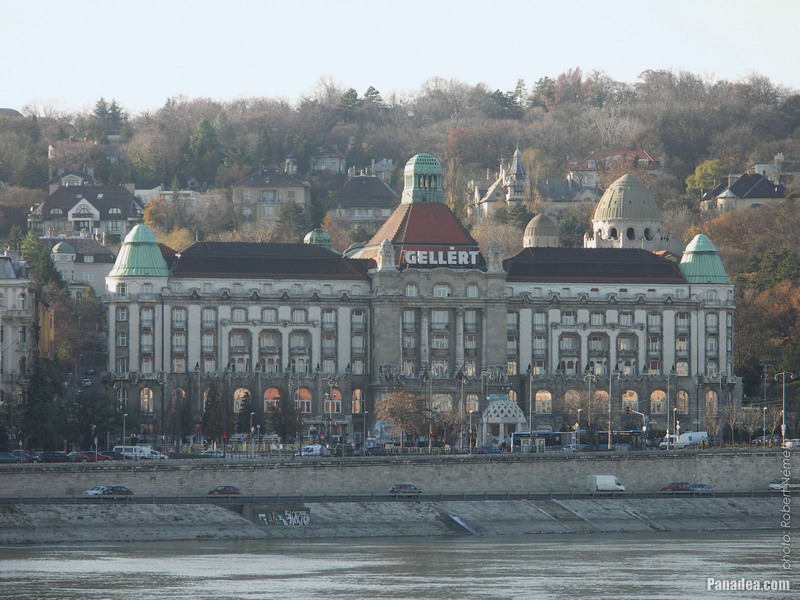 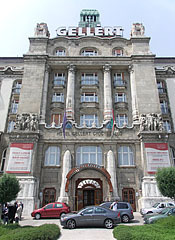 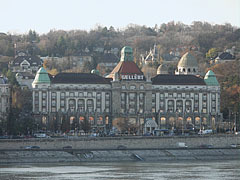 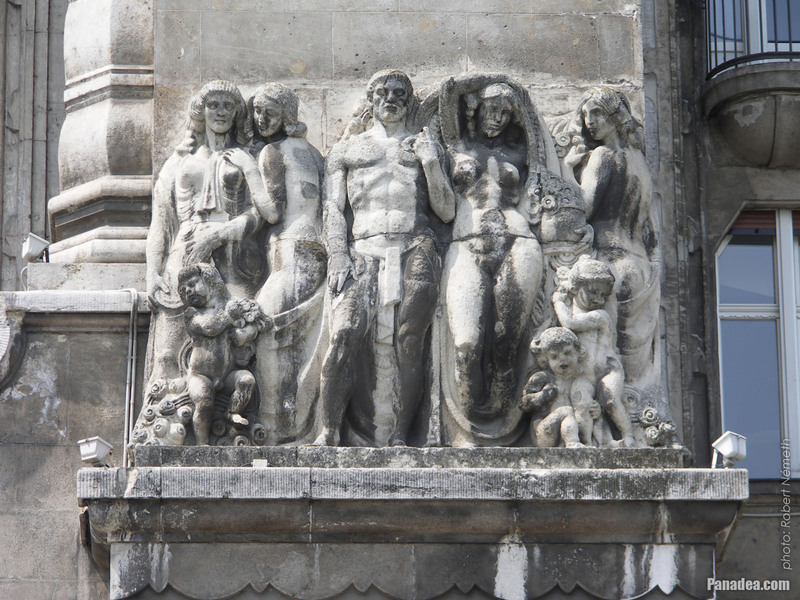 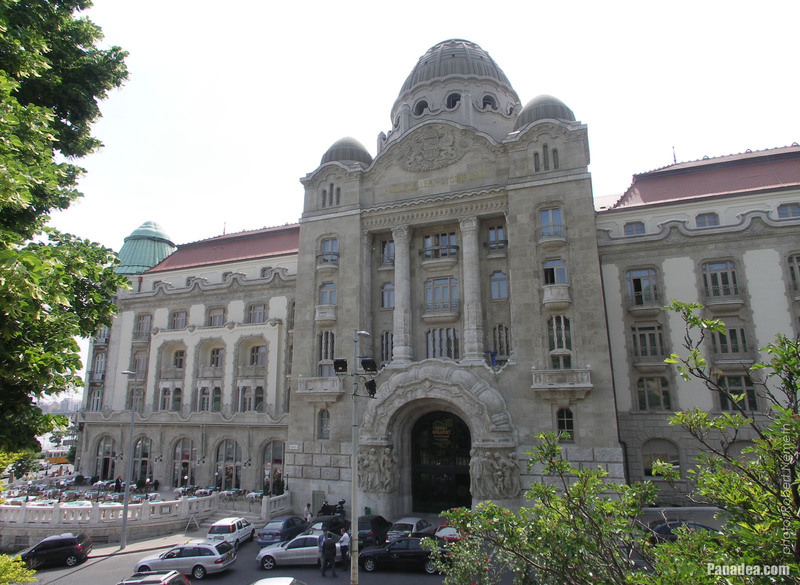 The complete neo-renaissance building complex was designed by Miklós Ybl, opened in 1882. Initially the Royal Gardens Kiosk was created to support water to the Royal Palace, this building was functioned as the engine house. Actually the decorative tower was also built just to hide the chimneys of the steam boilers. During a sewer construction in the area in 2009 an old cistern system (artificial water reservoir) was found that consists of at least six rooms and was forgetten for about hundred years. 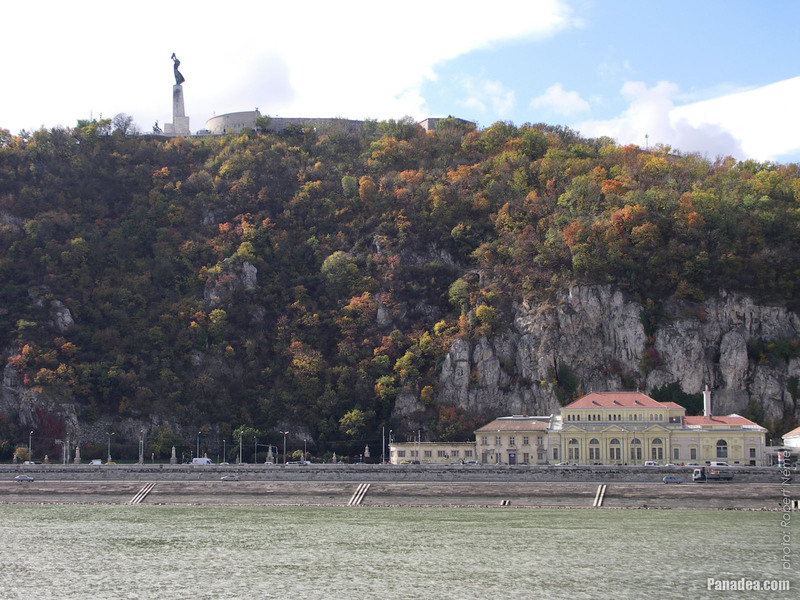 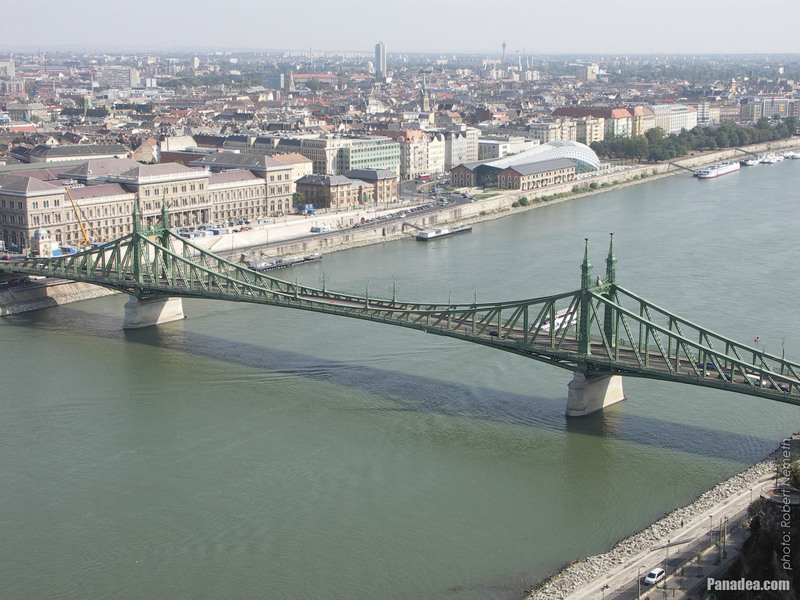 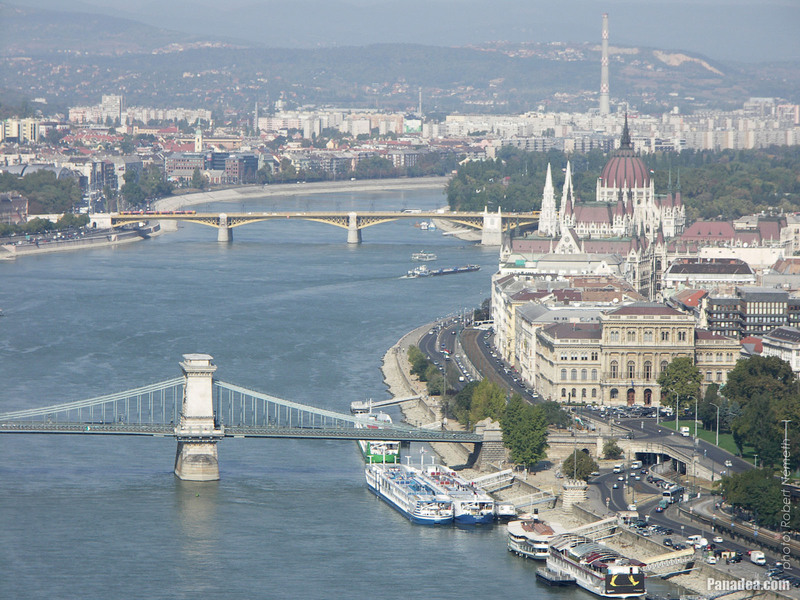 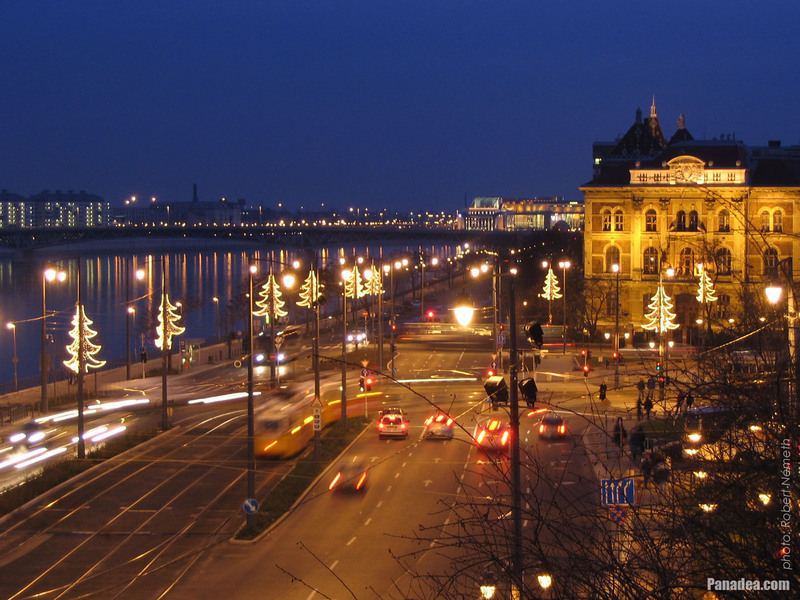 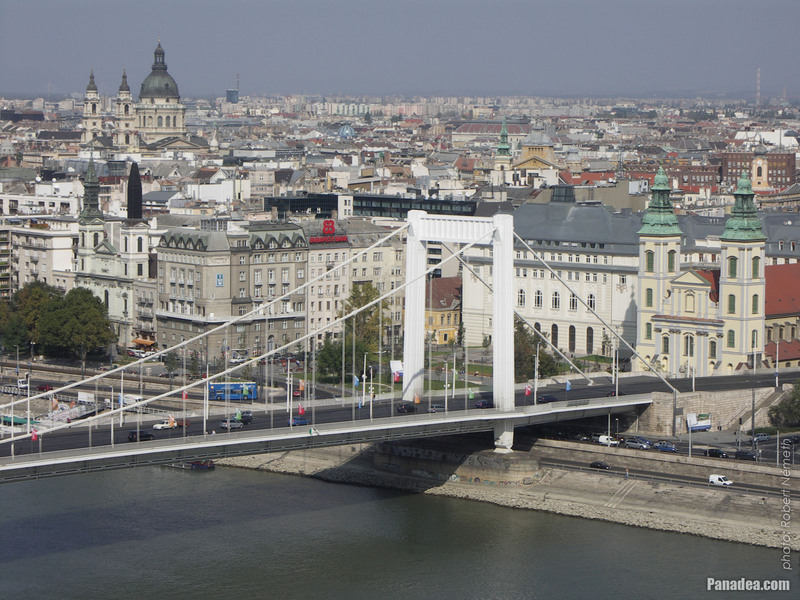 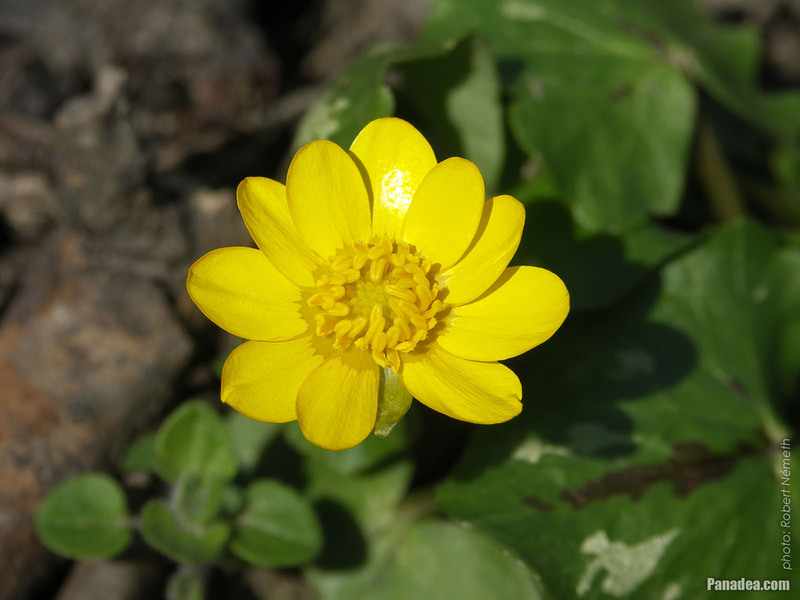 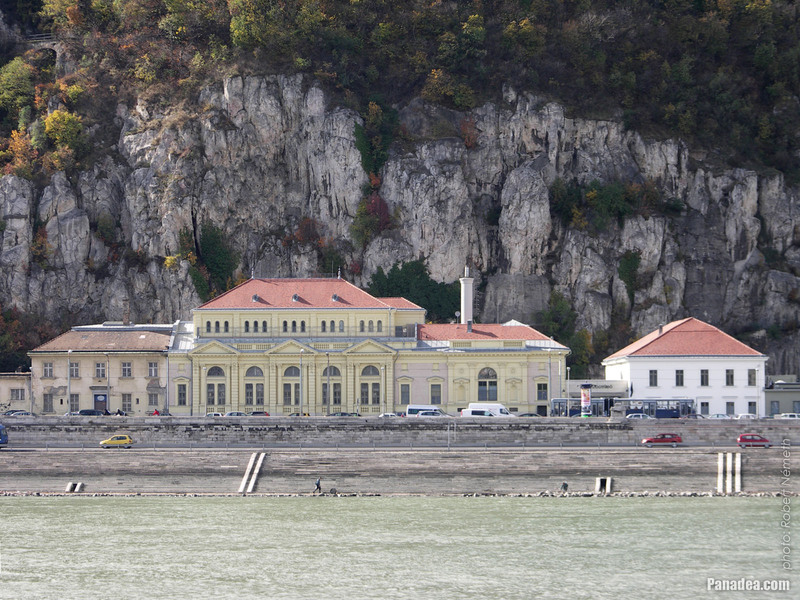 In the old times it purified the water of the Danube River using gravel layers. 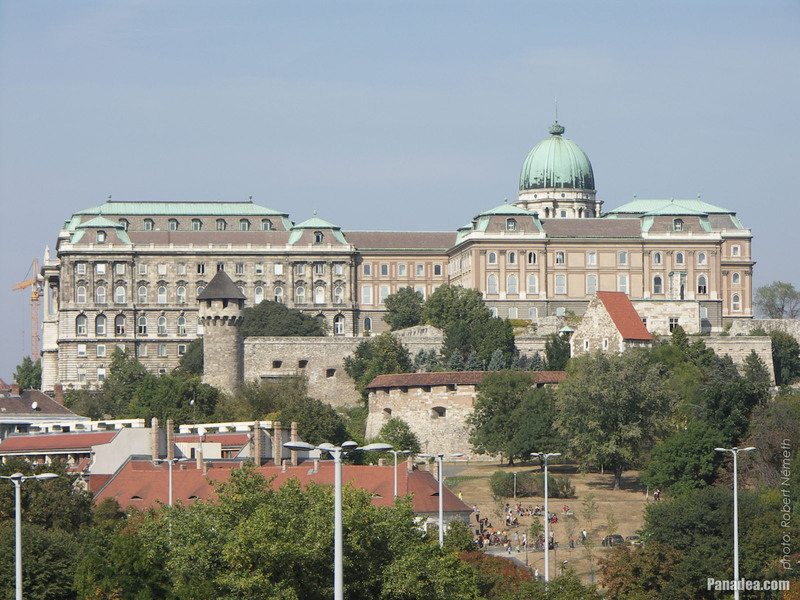 However once this technical facility was provided the water supply for the Royal Palace, until the construction of the public utilities in Budapest it was no longer needed and slowly sank into oblivion. 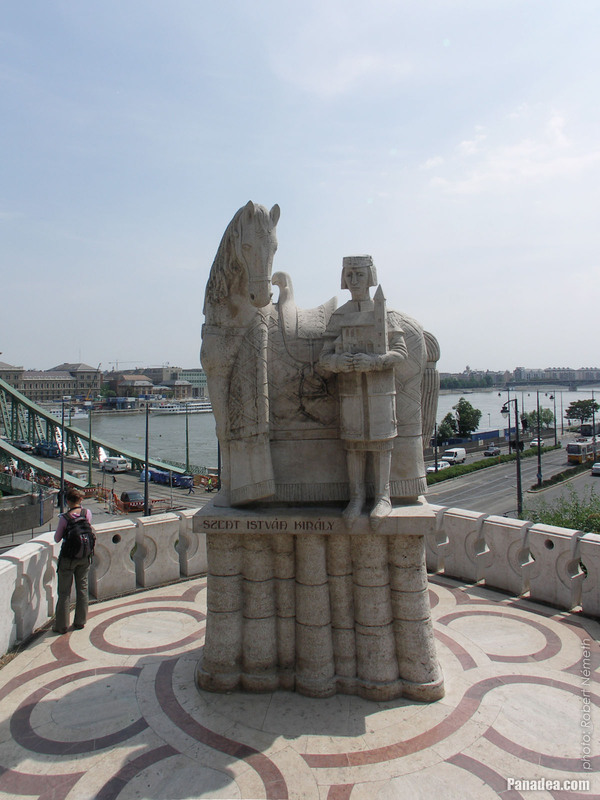 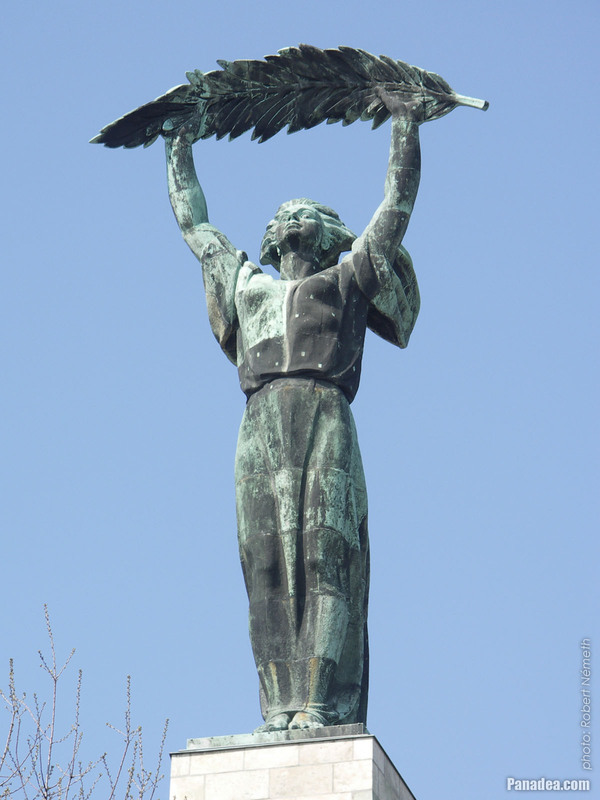 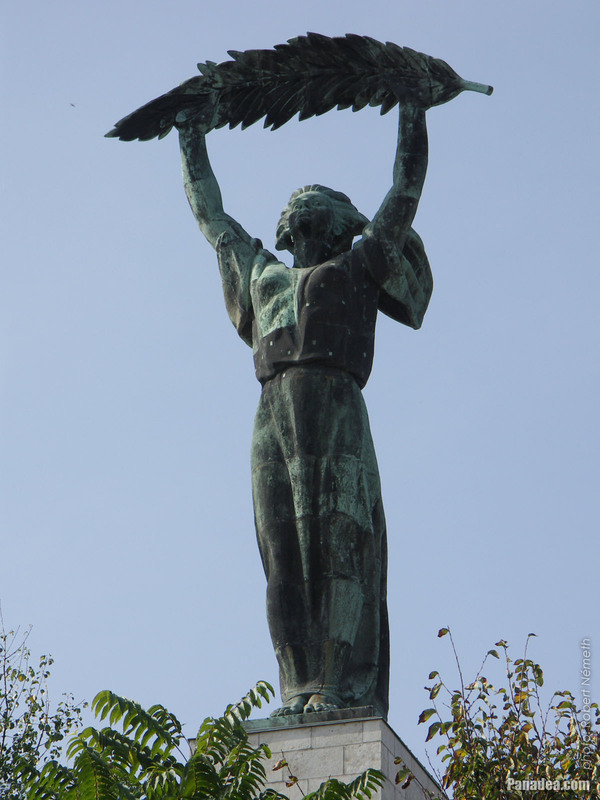 It is just an urban legend (so it is not true) that the Liberty Statue in Budapest was created initially in memory of the son of regent Miklós Horthy, who (the son) was died in a plane crash. 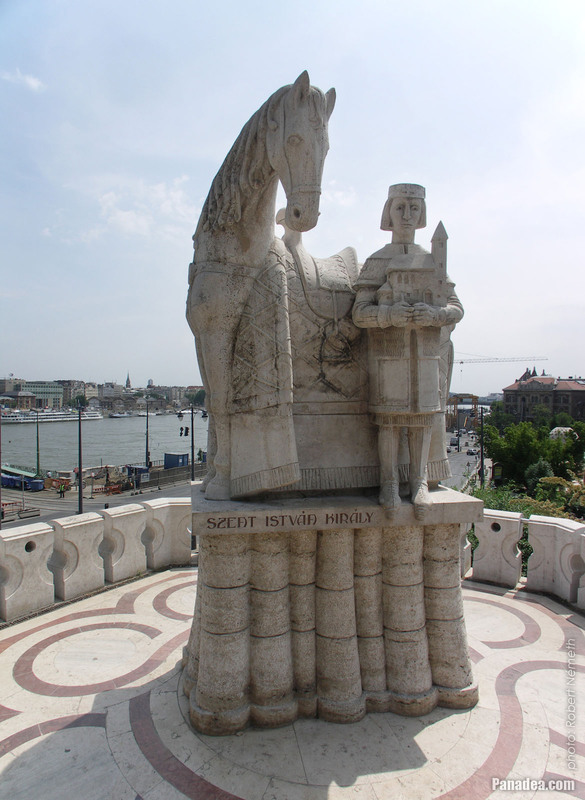 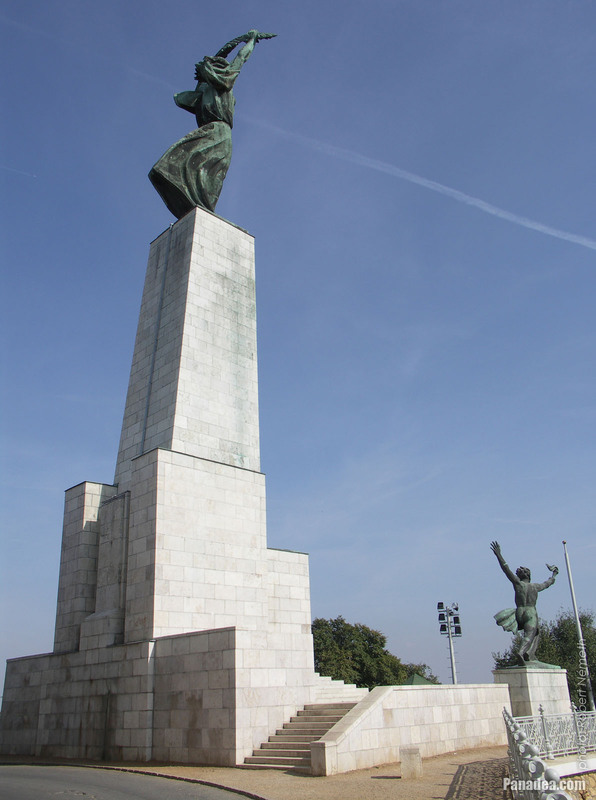 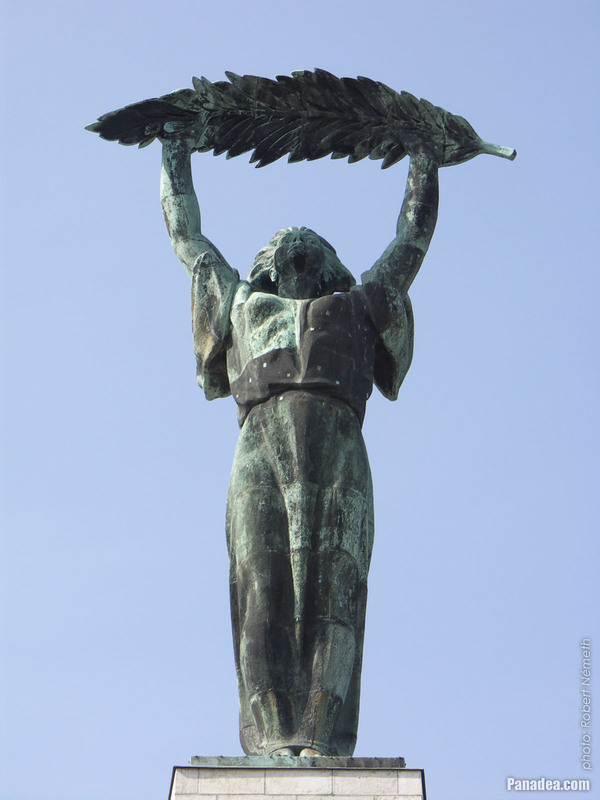 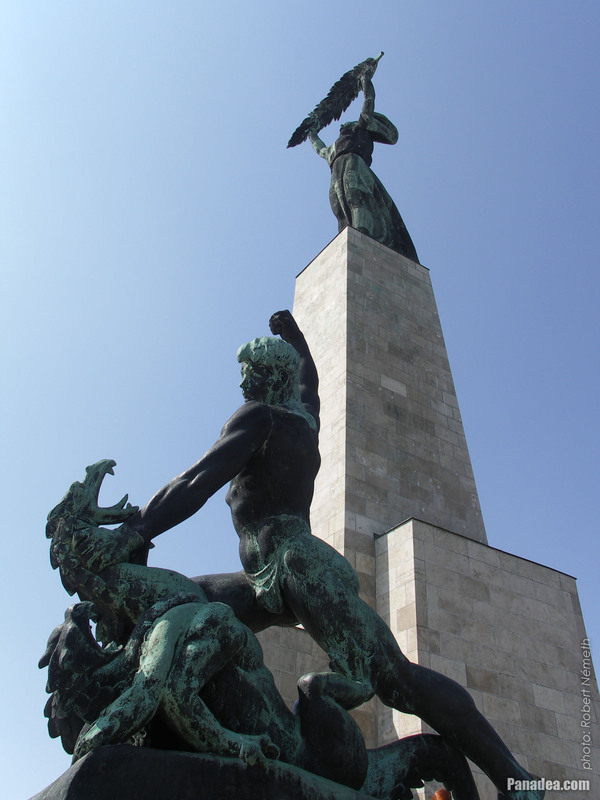 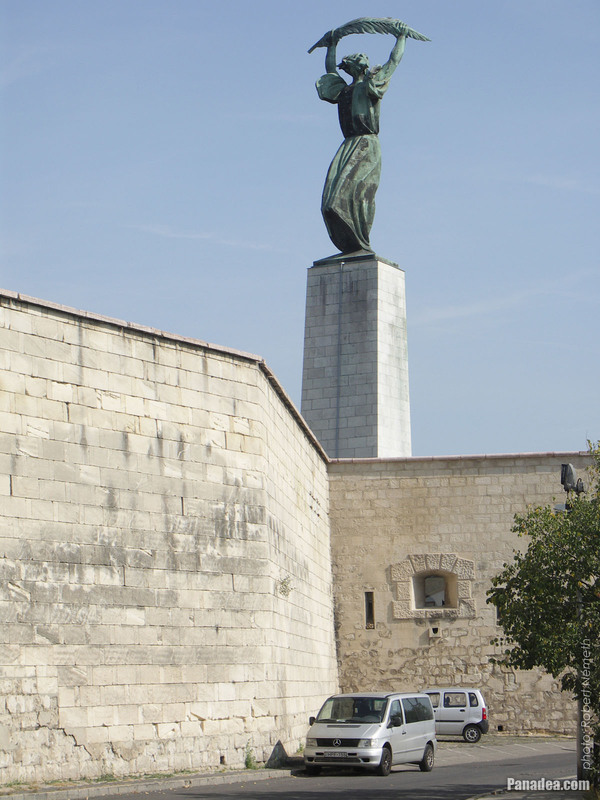 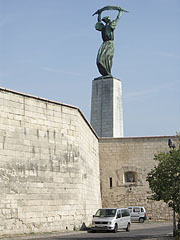 Although the sculptor Zsigmond Kisfaludi Stróbl received an order like this, that statue was never created and its plans did not show many similarities with the current Liberty Statue, that was created in 1947. 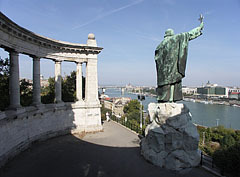 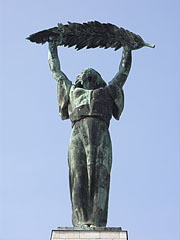 Bertalan Farkas (the first and still the only one Hungarian cosmonaut who had been in the space) took a miniature replica of the Liberty Statue of Budapest (in Hungarian "Szabadság-szobor") with himself to the Earth orbit in 1980, during the Soyuz-36 mission of the soviet Intercosmos program. 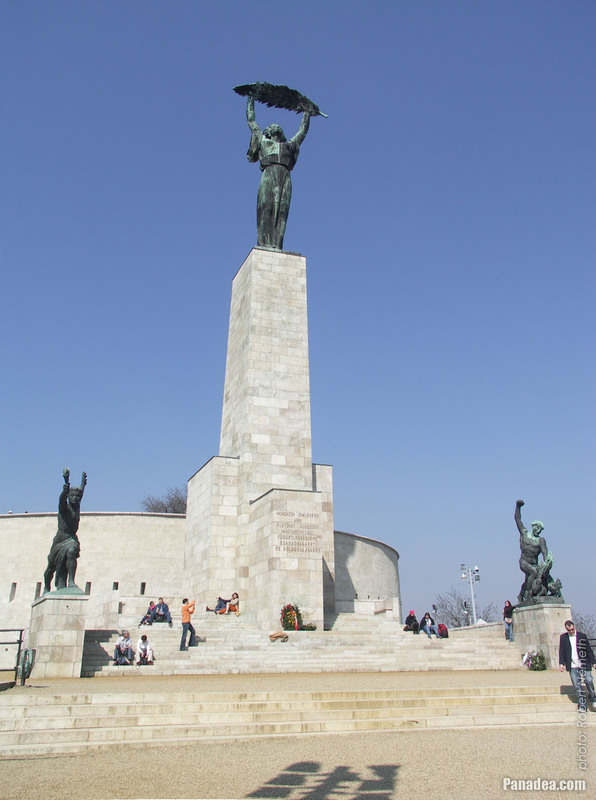 The co-astronaut and commander of "Berci" Farkas was the Russian Valeri Kubasov, as well as the Hungarian backup astronaut was Béla Magyari, but finally he never flew into space. 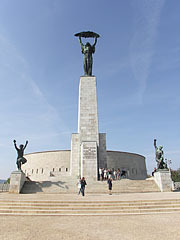 The main figure of the Liberty Statue of Budapest is 14 meters in height, but together with the stone pedestal the monument is almost 40 meters tall. 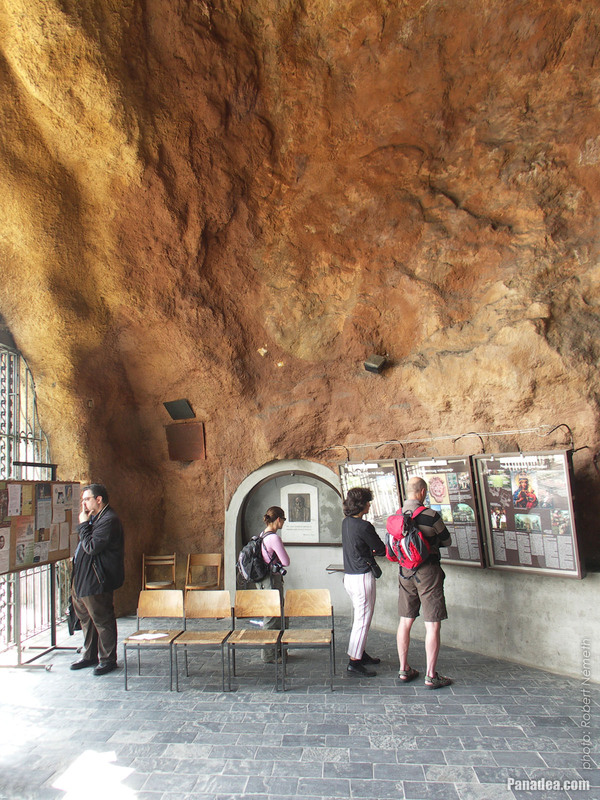 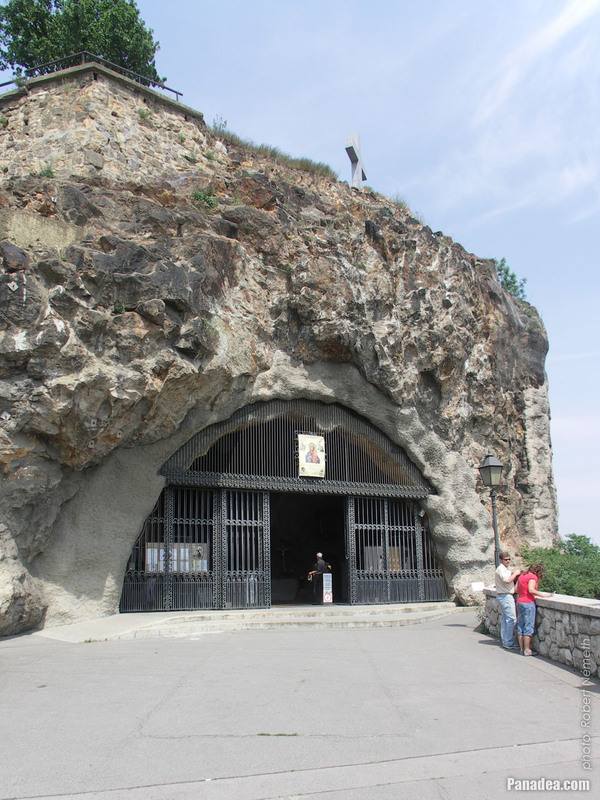 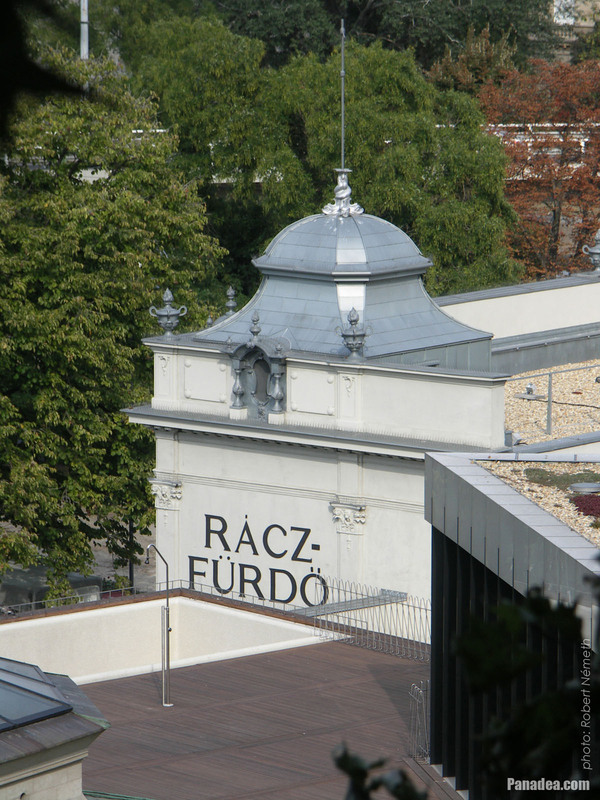 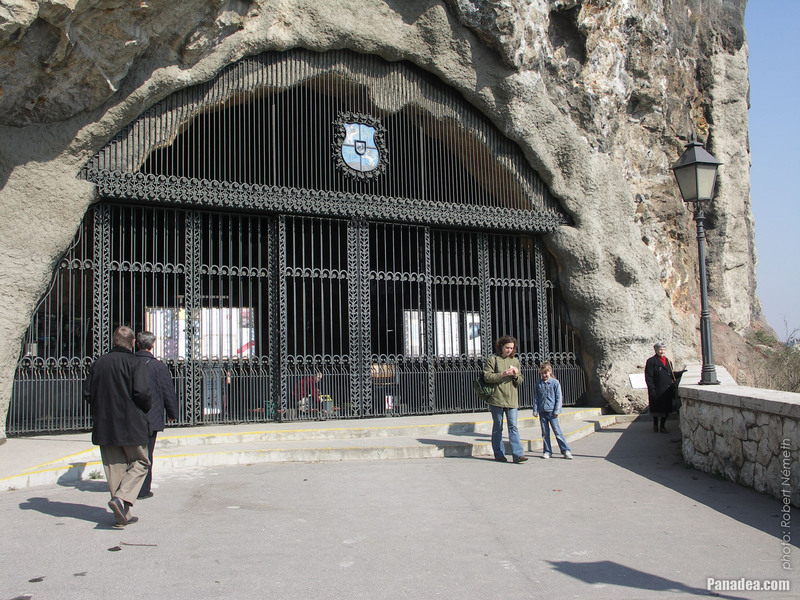 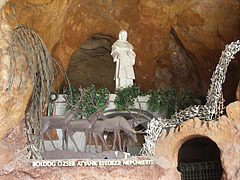 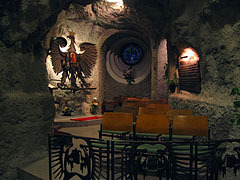 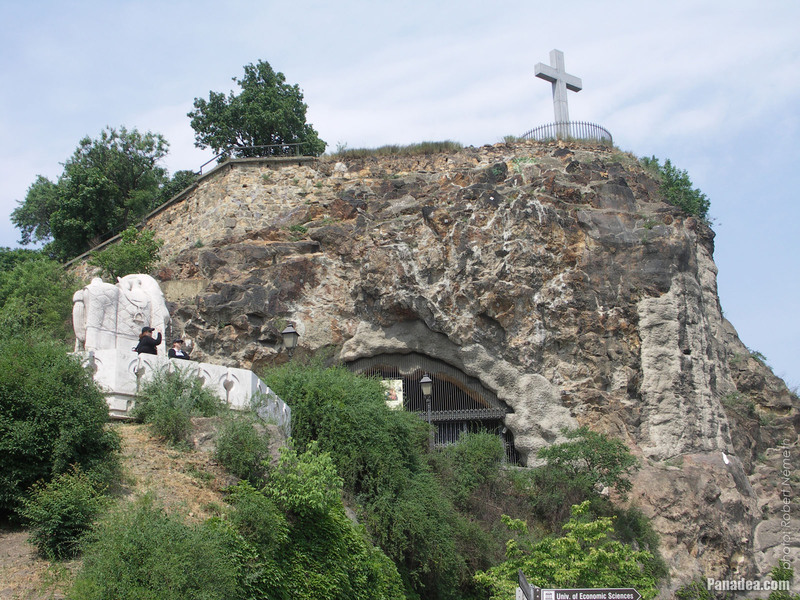 The Cave Church (in Hungarain "Sziklatemplom") was created by Károly Weichinger in 1931, by the plans of Kálmán Lux. Few years later, in 1934 a neo-romanesque style Pauline monastery was built and annexed to the cave church. 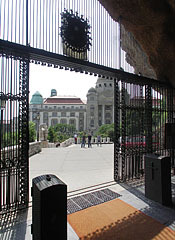 Above the gate it is the coat of arms of the Pauline Order, because the cave temple was created for the Pauline Order that was disbanded in Hungary for about 150 years, but at that time they could settle back to their homeland. 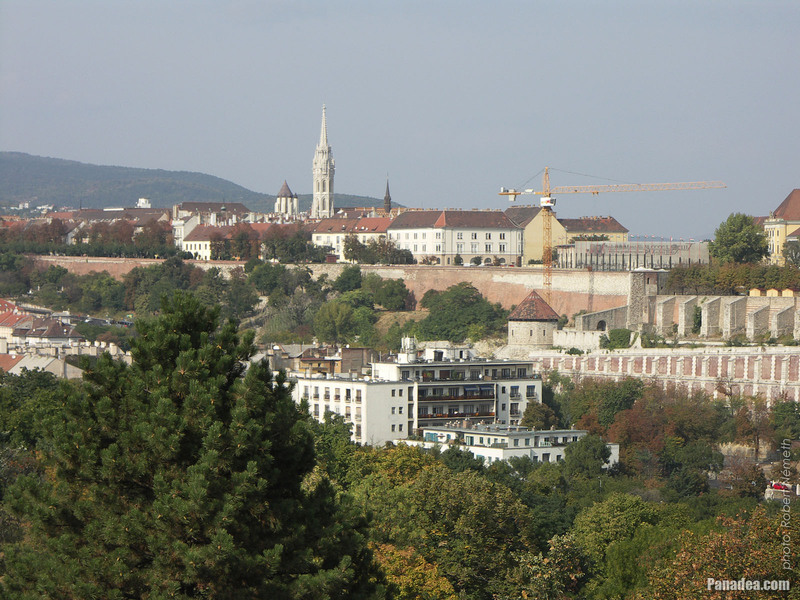 The Pauline is the only one male religious (or monastic) order that was founded in Hungary. 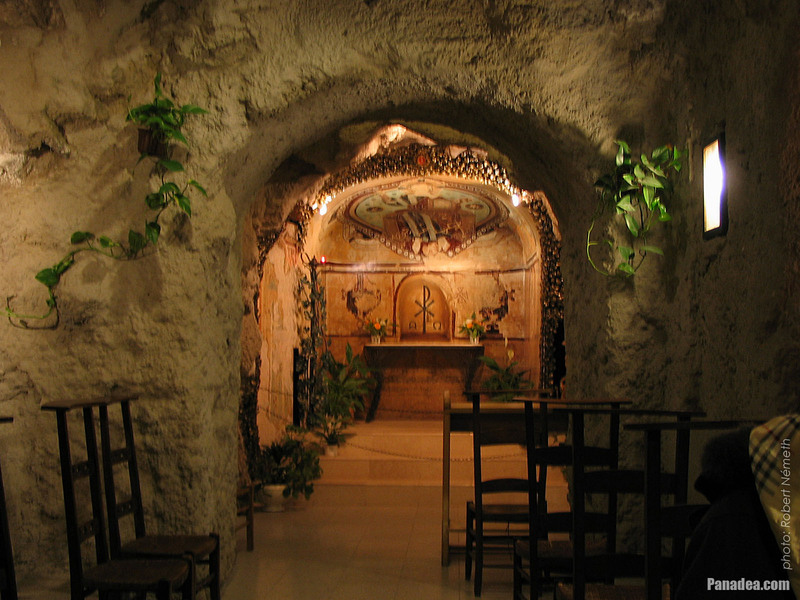 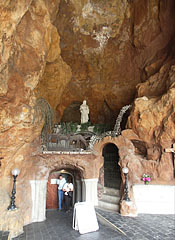 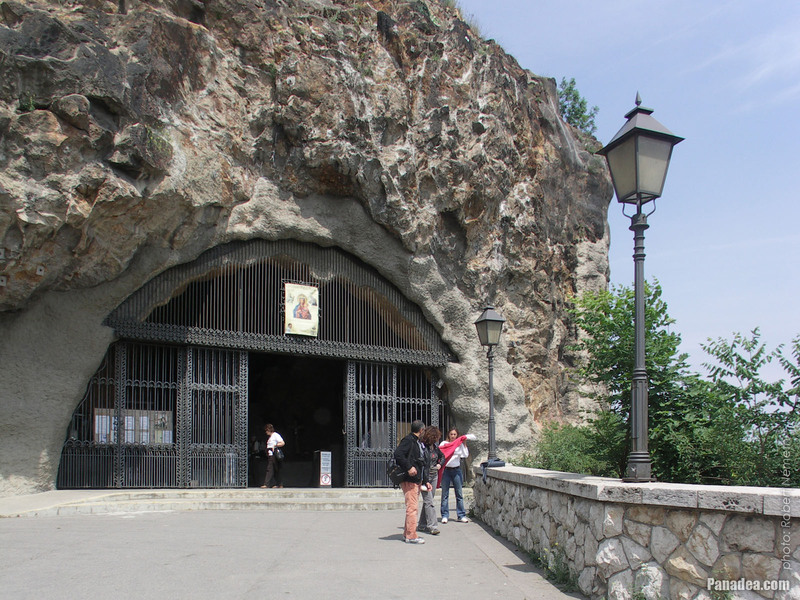 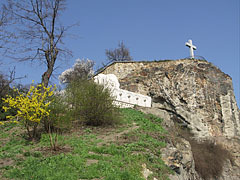 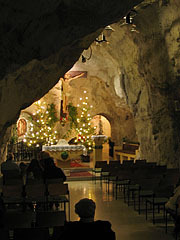 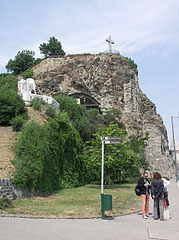 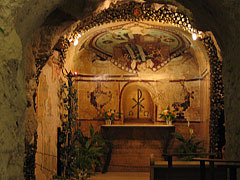 The Cave Church consists of two parts. 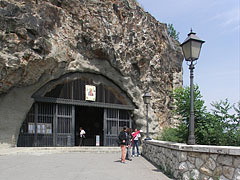 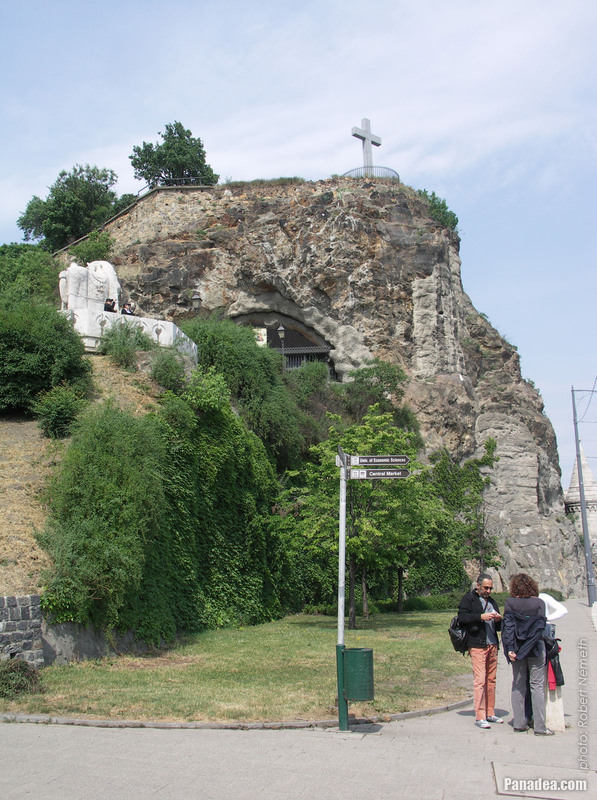 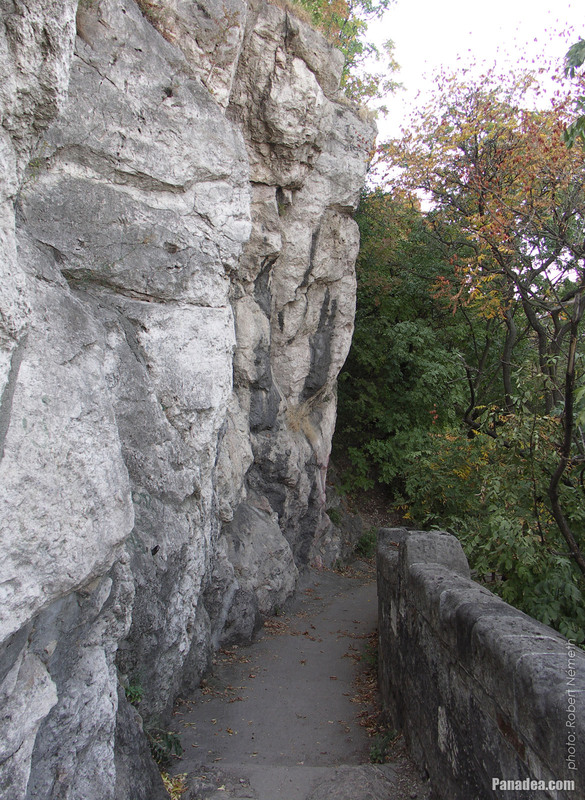 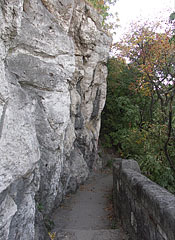 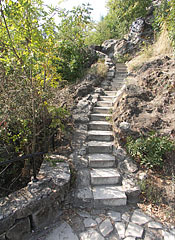 Above there is an ancient natural cave (the St. Ivan's Cave or Lourdes Cave), as well as below an artificially hollowed rock cavern. 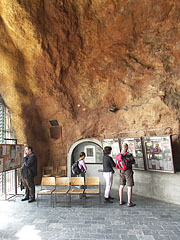 The cave temperature is constantly 21°C. 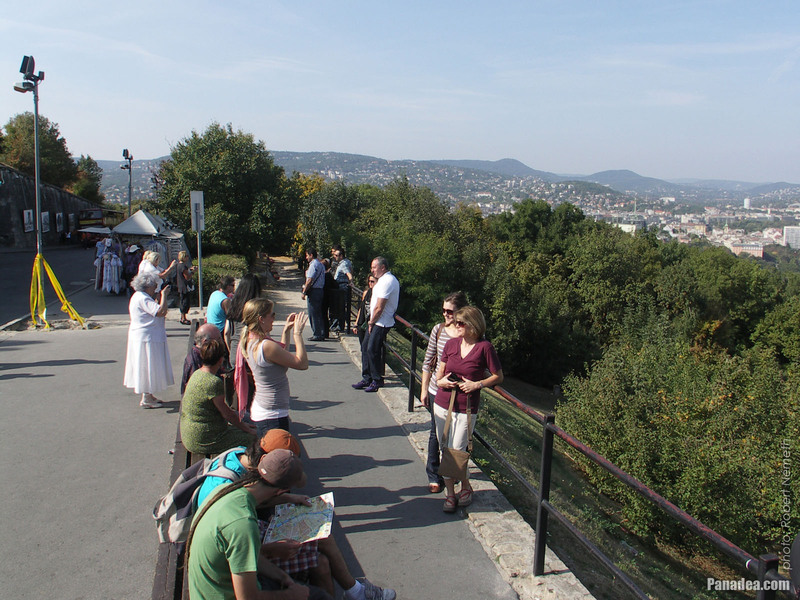 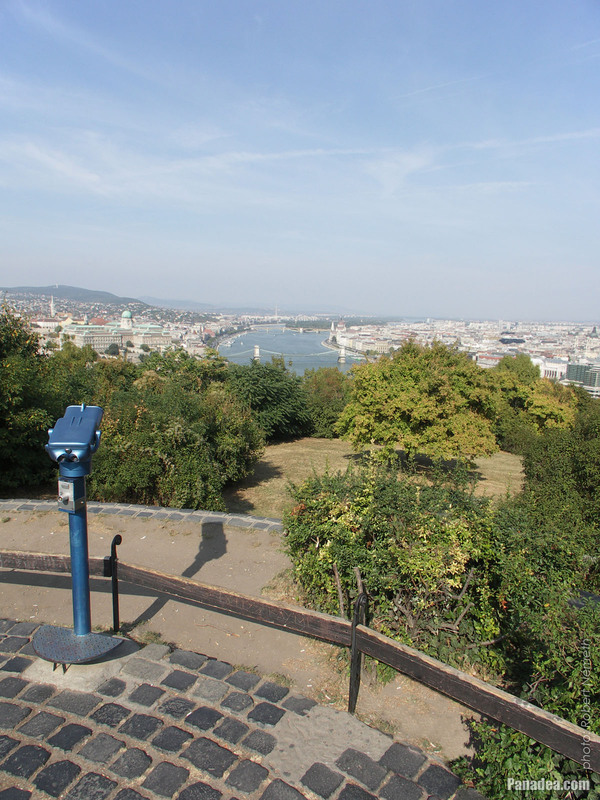 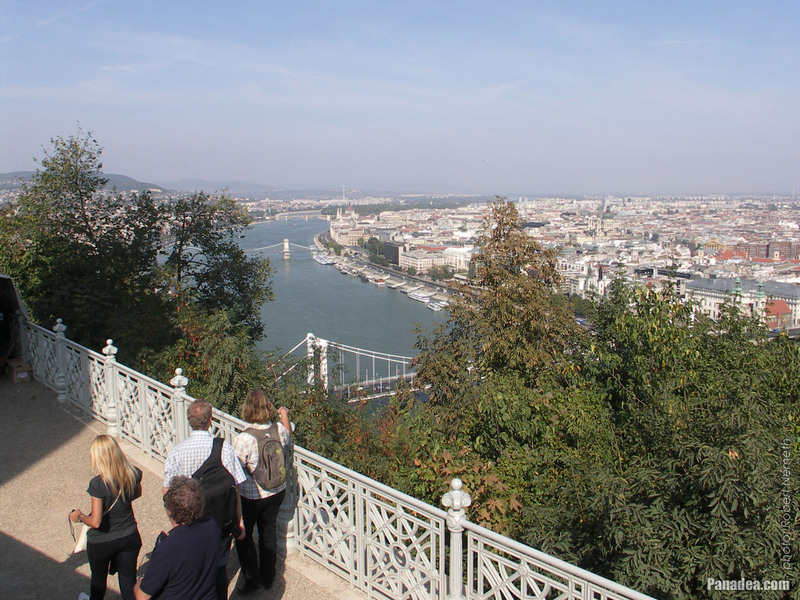 The hill is just 130 meters above the Danube River, and its height above sea level is also just 235 meters, but despite it the sight of the capital city from the hilltop is amazing. 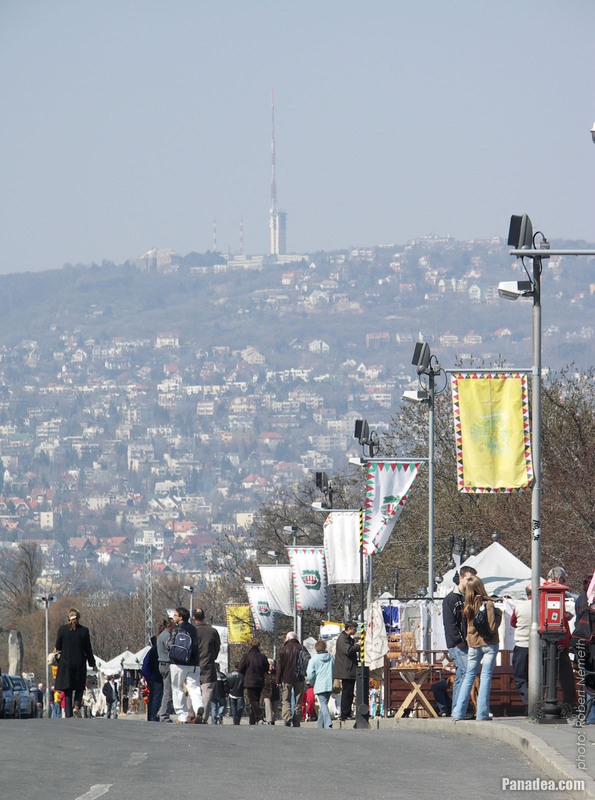 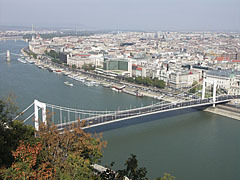 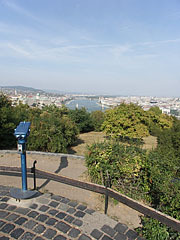 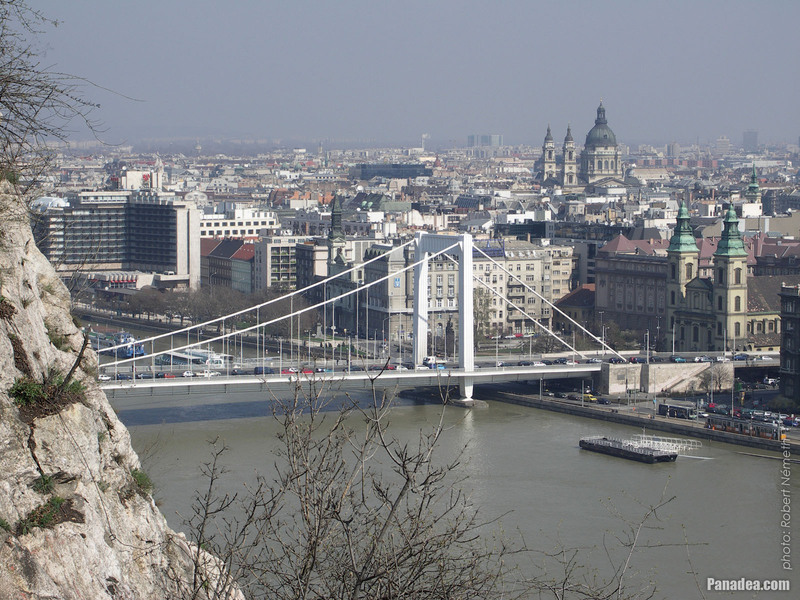 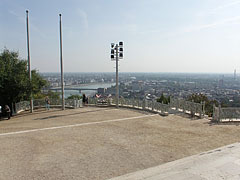 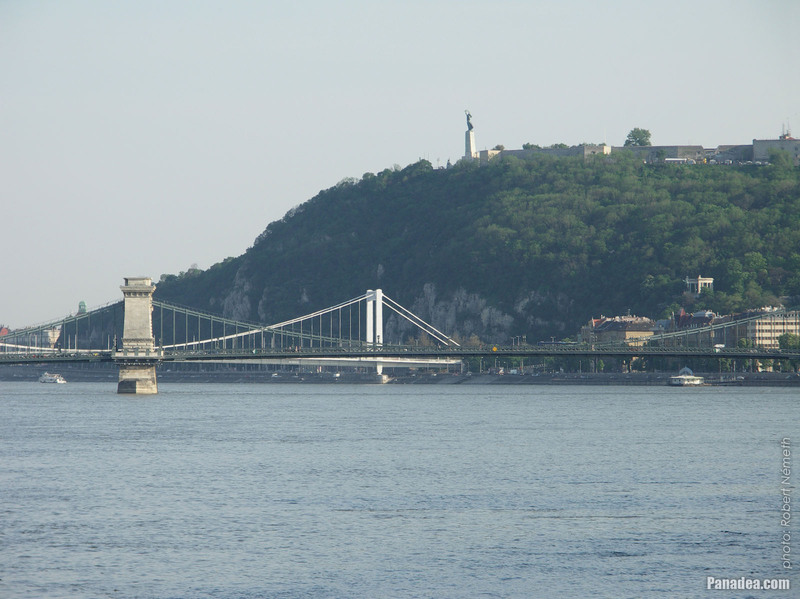 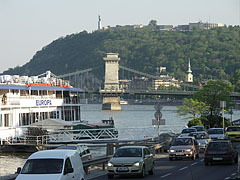 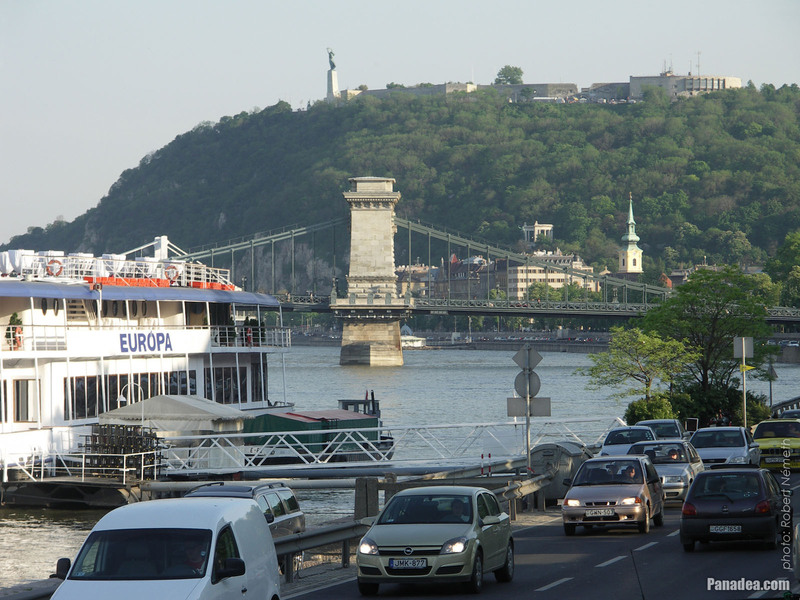 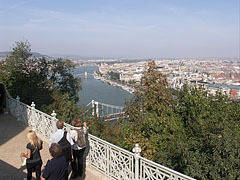 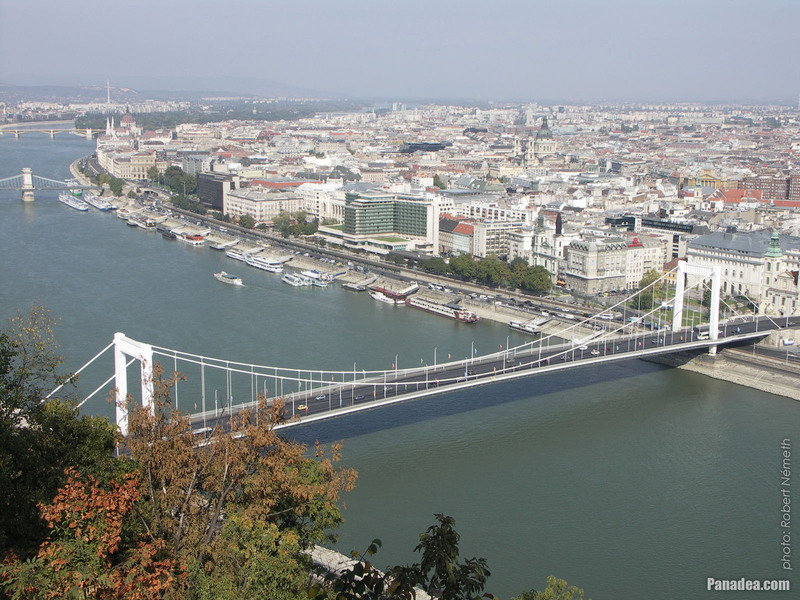 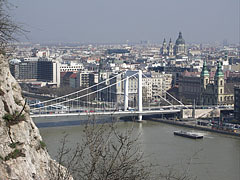 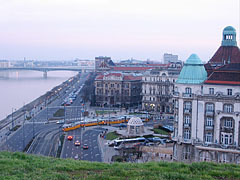 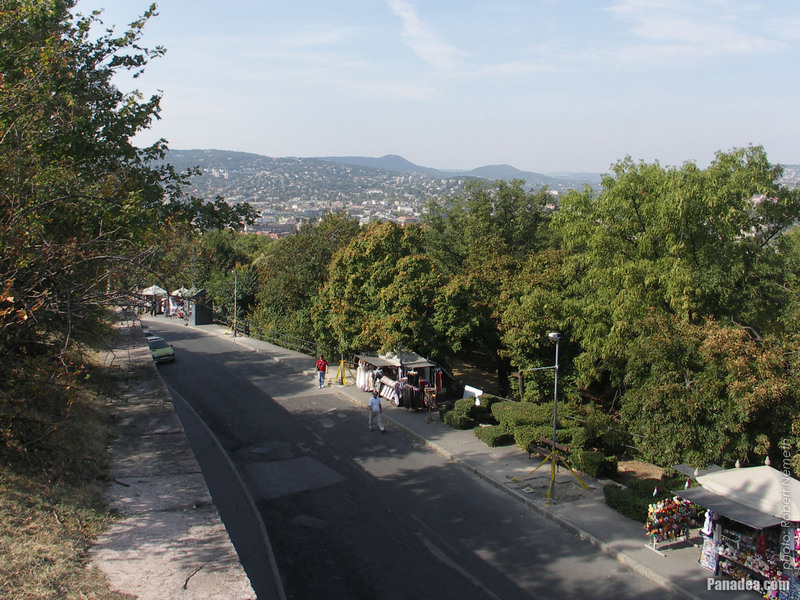 The Gellért Hill in Budapest, Hungary is listed in the UNESCO World Heritage since 1987. 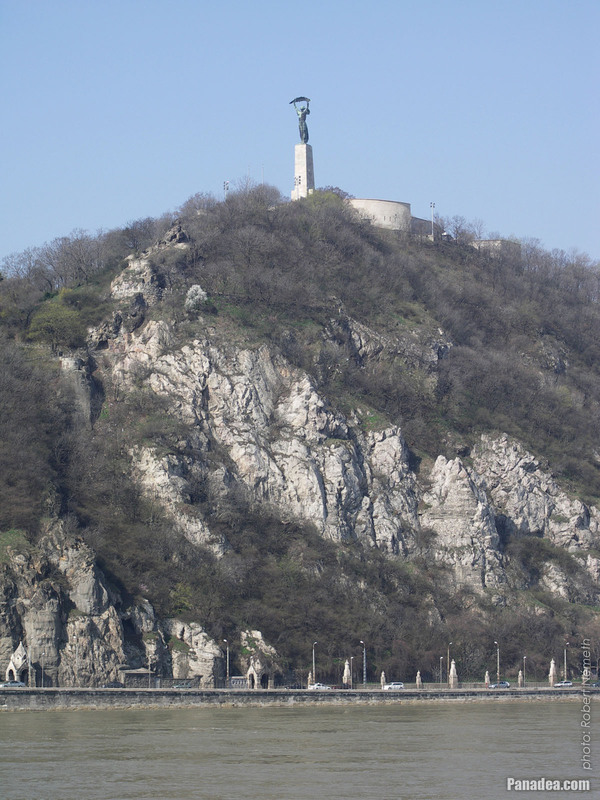 During the Age of Árpádian kings (the Árpád dynasty) in the 11th-13th centuries the name of the present Gellért Hill was Kelen Hill. 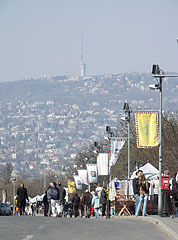 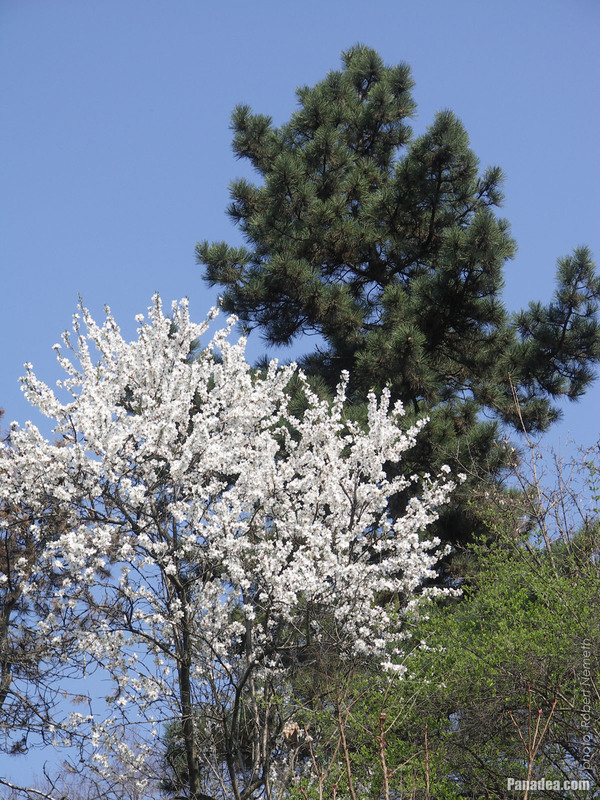 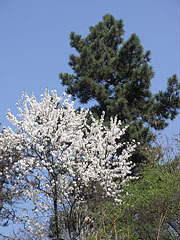 There is a street name that still reminds to it: the Kelenhegyi út (Kelenhegyi Road, "Kelenhegy" means "Kelen Hill"). 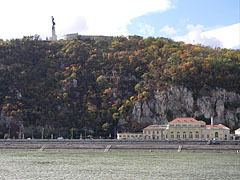 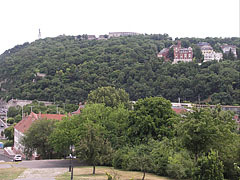 It was started to call "Szent Gellért-hegy" or "Szent Gellért hegye" (literally "Hill of Saint Gerard") from the 15th century onwards.